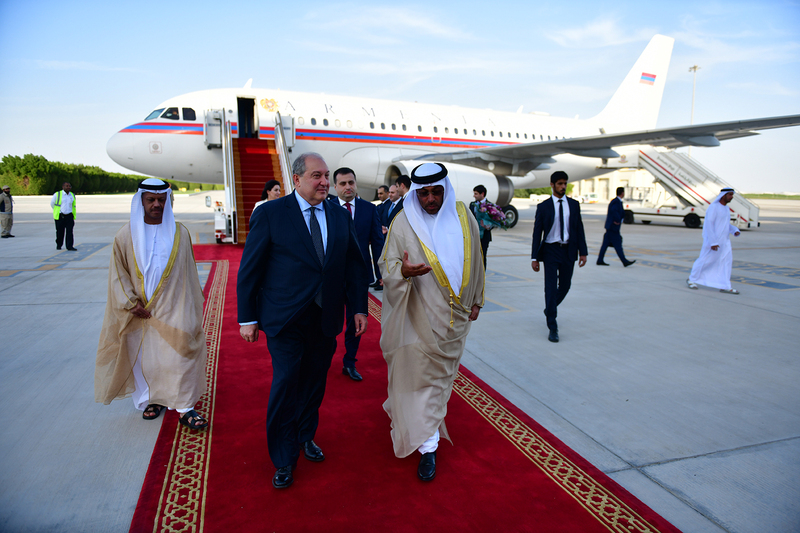 President Armen Sarkissian arrived to the United Arab Emirates with the official visit. 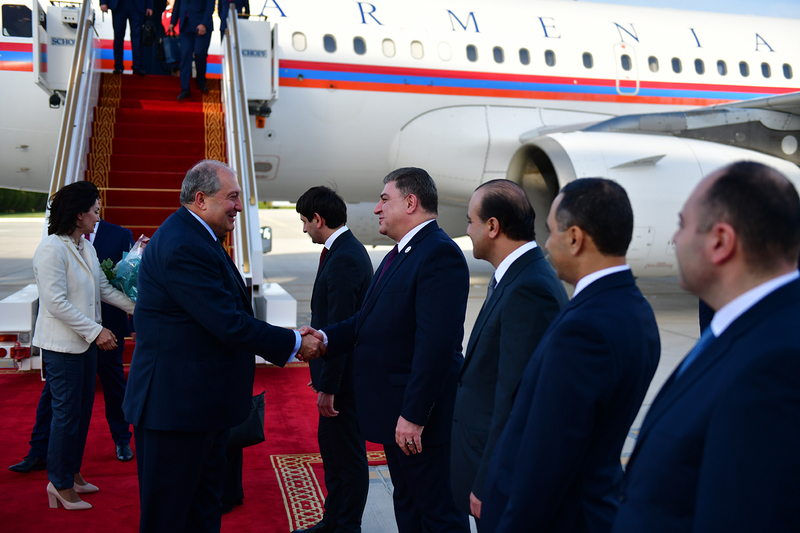 President Armen Sarkissian arrived to the United Arab Emirates with the official visit. 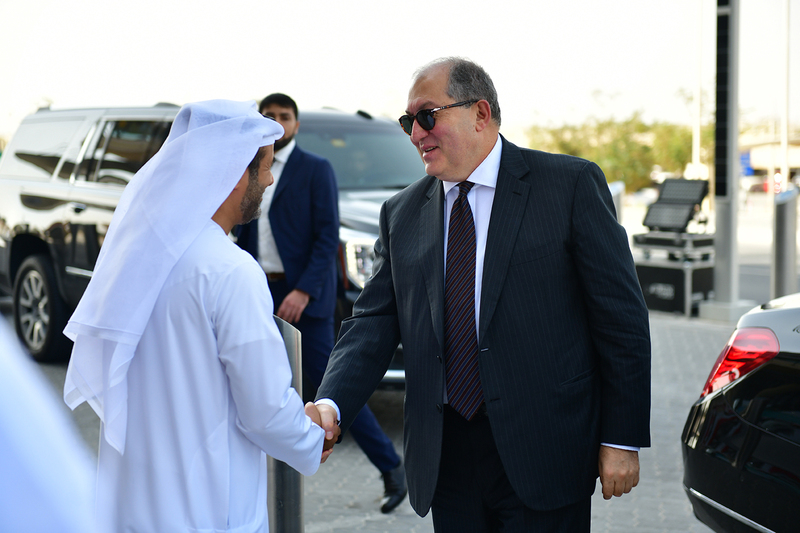 According to Armen Sarkissian, our country is famous for its fruit and vegetable production and processing, dry fruit production and in this area the two countries can launch a mutually beneficial cooperation. 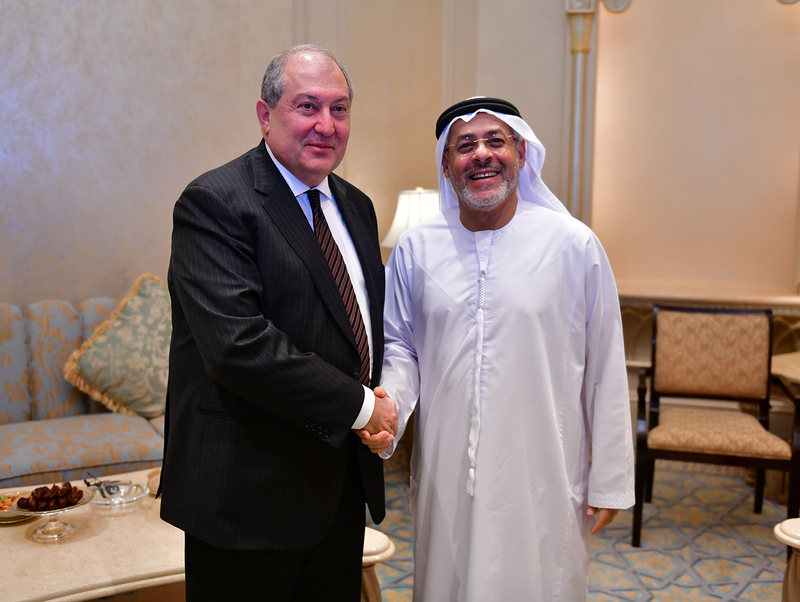 President Armen Sarkissian, who is in the United Arab Emirates on official visit, in Abu Dhabi met with the Minister of State of the UAE Sultan Al Jaber. 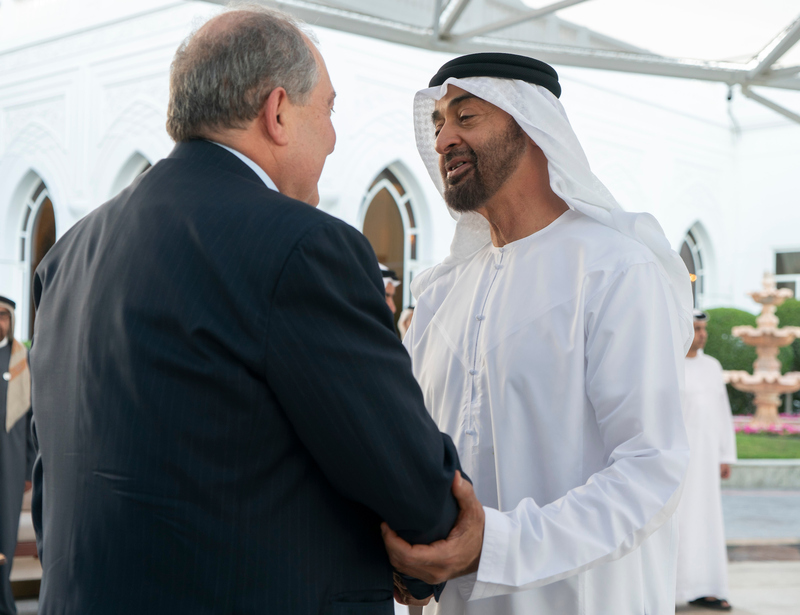 The President of Armenia and Minister of State of the United Arab Emirates spoke about opportunities for cooperation, in particular, implementation of joint projects in different areas. 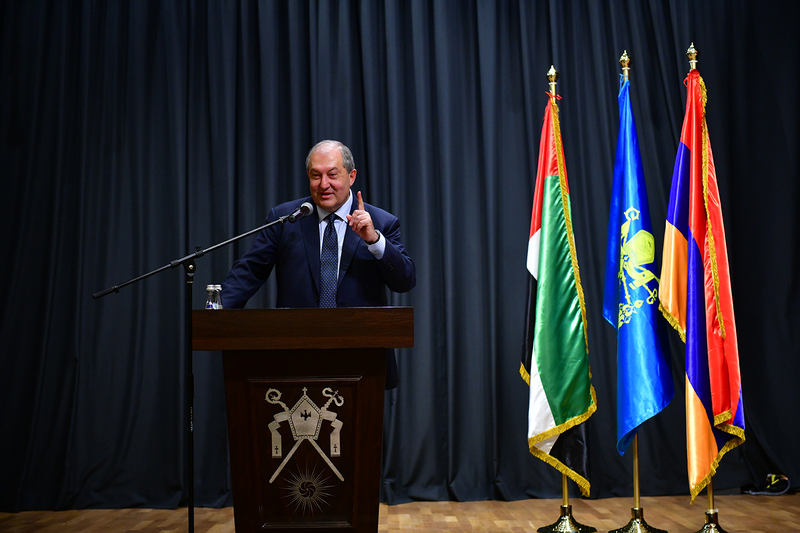 According to President Sarkissian, through the years, there have been minor and major achievements but the existing potential is much greater. 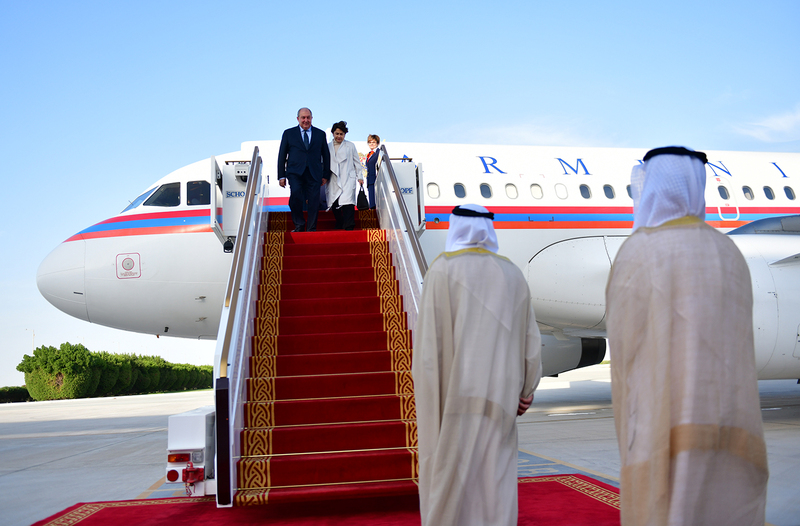 The official visit of the President of Armenia to the United Arab Emirates commenced with the meeting with the Crown Prince of Abu Dhabi, Deputy Commander-in-Chief of the UAE Sheikh Mohammed bin Zayed bin Sultan al-Nahyan. 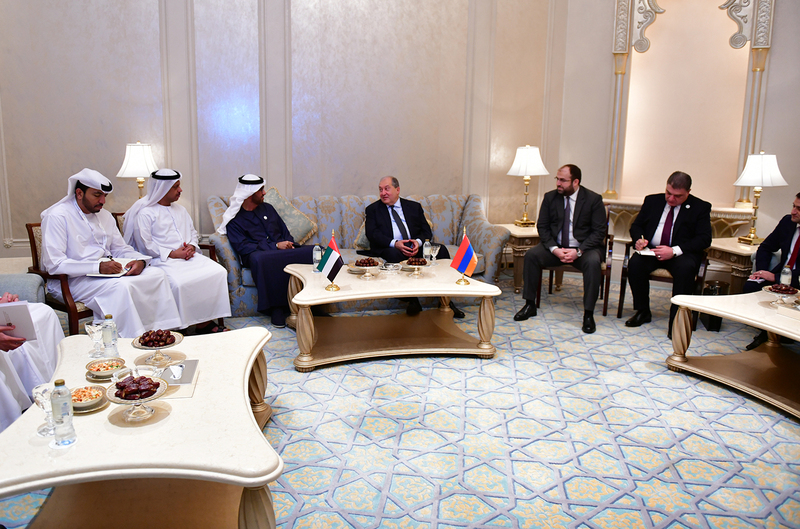 During the warm and candid conversation, President Armen Sarkissian and Crown Prince Sheikh Mohammed bin Zayed bin al-Nahyan discussed the entire range of the Armenia-UAE relations, stressed the importance of the intergovernmental commission in boosting the existing tempo of the trade and economic ties. 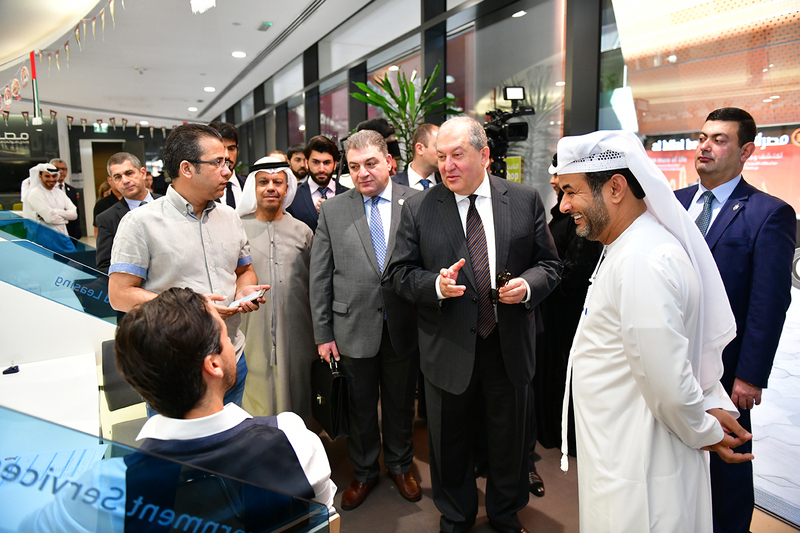 According to the interlocutors, the commission is a favorable platform to study each other’s markets, to explore possibilities for the mutually beneficial investments as well as to follow the reforms and innovations in the economies of the two countries. 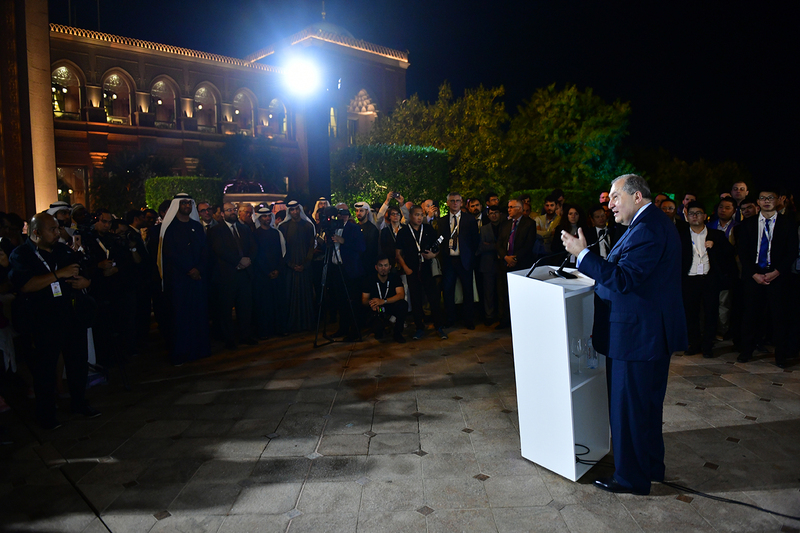 Underscoring the existing great potential in the trade and economic areas, President Sarkissian viewed as promising cooperation particularly in the areas of agriculture, renewable energy, chemical production, information technologies and telecommunication areas. 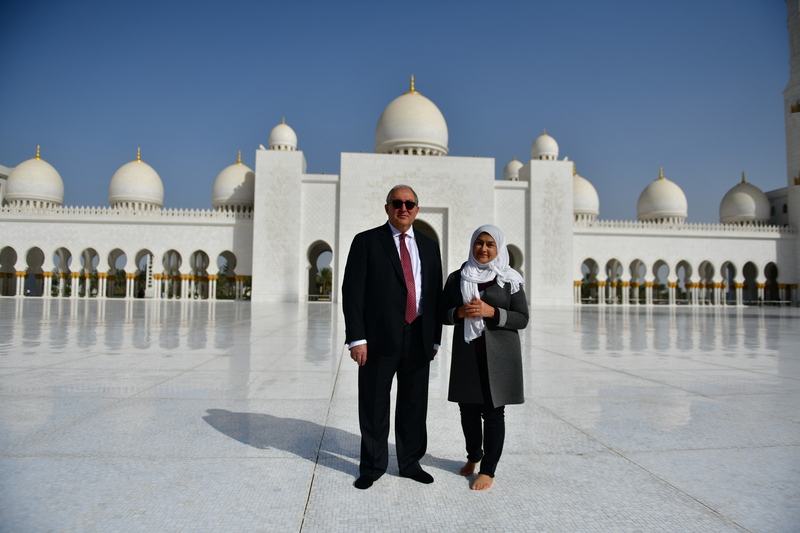 Noting that Armenia views the UAE as an important gateway to the Persian Gulf region and other countries, Armen Sarkissian said that Armenia in its turn might become a bridge for the UAE towards the EAEA and CIS countries and markets. 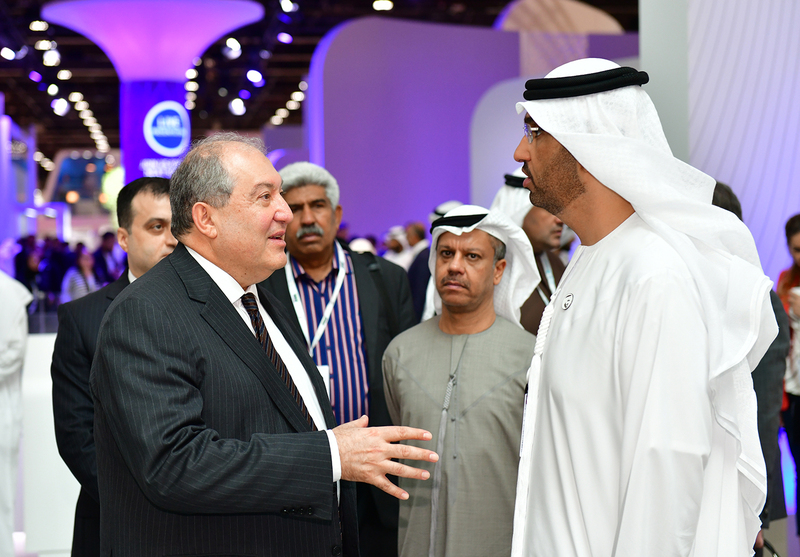 President Sarkissian and Sheikh Mohammed bin Zayed bin al-Nahyan spoke also about the cooperation in the areas of culture, science, and education, as well as about the existing great potential in the area of tourism. To boost contacts between the peoples of the two friendly states and to increase the level of mutual recognizability, the parties stressed the importance of cultural cooperation and implementation of joint programs. 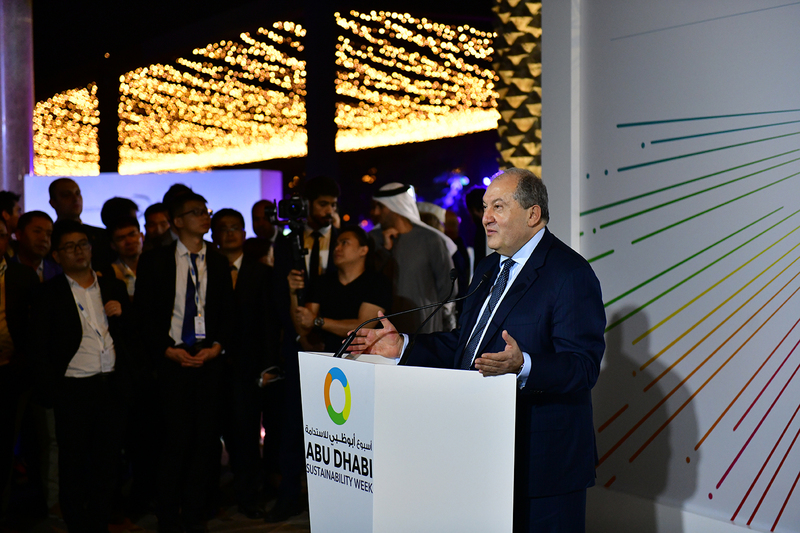 President Armen Sarkissian, who is in the United Arab Emirates on official visit, participated at the reception offered for the heads of delegations participating to the major Abu Dhabi Sustainable Week International Forum where he made a statement. 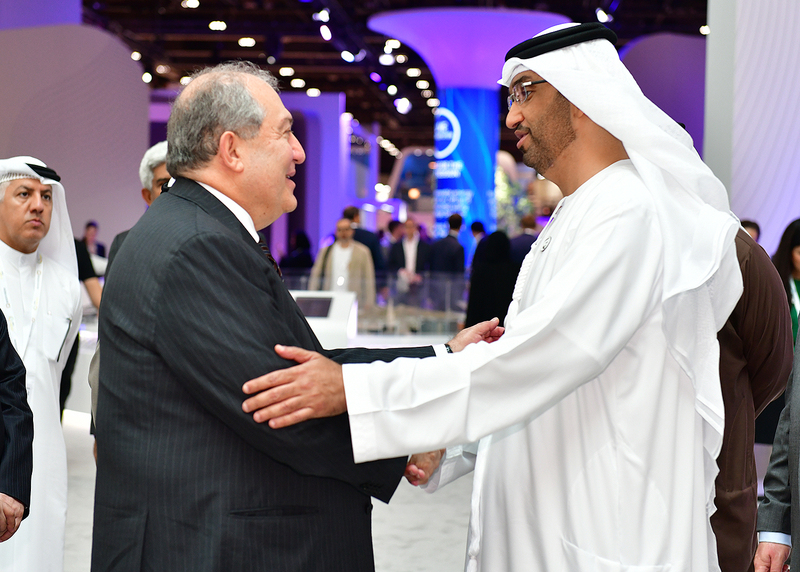 President Sarkissian thanked the authorities of the United Arab Emirates and the government for the invitation and opportunity to participate at the Forum. “We all realize that we are living in the 21st century – a century which is very special, in which the world is interconnected, where things are happening with the speed of light. This is a totally different world. I would like to briefly speak about a thing or two. The first is globalization. There is an opinion that today globalization has stopped. I cannot agree with that. Globalization is not a macroprocess any more, it has become a microprocess. Peoples, trade, relations and ties, information in the current world are so interconnected that globalization will go on and will gain even a greater speed. Second, we are talking about an industrial revolution, the fourth industrial revolution. What we’ll have will be a rapid or a steadfast revolution because it will take place in science, in technologies and trade areas, in biology, as well as in our behavior. Rapid revolutions will take place also in our everyday life. They are taking place in the world even now, and Armenia is one example. 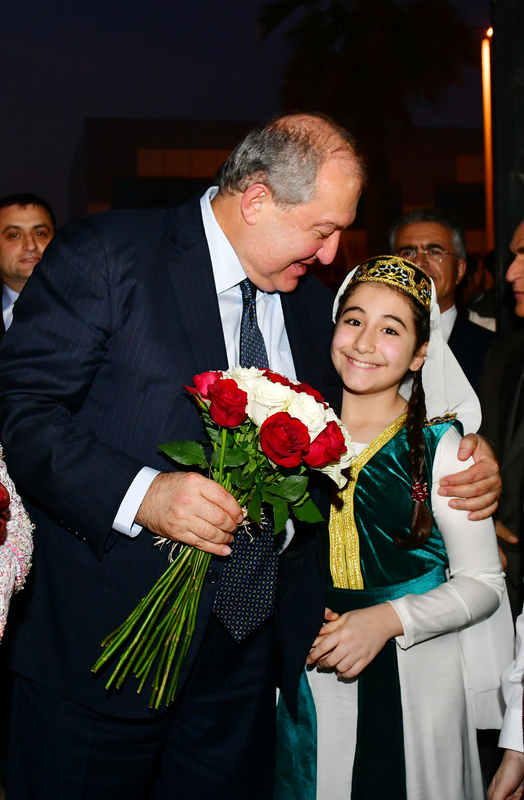 Nearly one year ago, on April 9, I became President of the Republic of Armenia. The Revolution started days before that; it started with 5 individuals that later became100, 500, 1000, 5000… In two weeks, we had a revolution which united hundreds of thousands. All this was not organized; it was not carried out by a political force. It was a “Facebook” revolution, a revolution of the 21st century. It means that rapid revolutions are taking place also in the political life. The world is becoming more and more non-classical by day. I would like to take the example of quantum physics. One hundred years ago, physicists understood everything that was going on in the world and were able to explain everything. But gradually there appeared phenomena which they couldn’t explain because the laws of classical physics were not working any more, the logic of classical physics didn’t work. All this went on until one of the giants – Albert Einstein created a theory called the behavior of elementary particles which was not classical at all. In classical physics, for particles to move from point A to point B it is necessary to cover a certain distance. But in quantum physics or in physics of small particles, according to the theory of probability, could be at any place. Thus, this is a totally different way to look at the natural world. In the 21st century we are entering the period of global risks and the period of quantum behavior of politics. Social and political events in the 21st century will have a totally different behavior. Technologies of behavior of global risks, pandemics, or terrorist acts will differ from those of the 21st century. Risks appearing in New York of Washington can cause great changes all over the world. People may lose billions of dollars. I would like to stop here since these are just excerpts from my book which I am about to finish. It will be published in spring and will be titled Quantum Behavior of Global Risks". 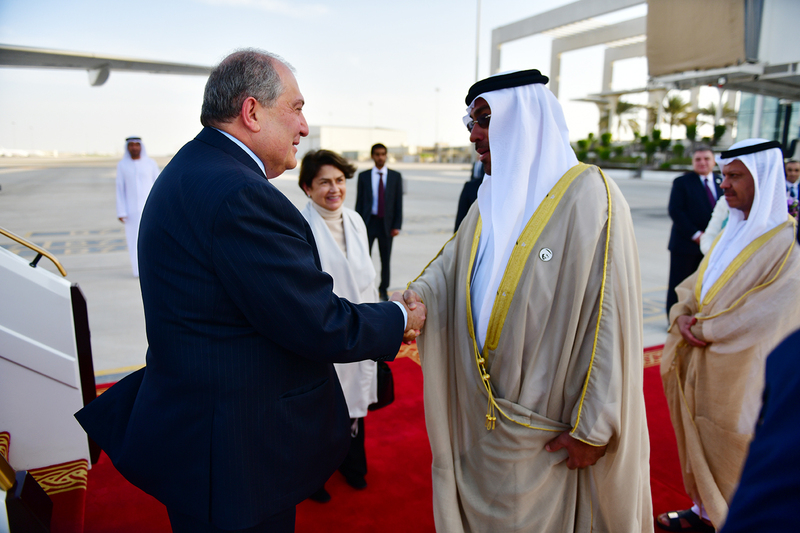 President Armen Sarkissian, who is in the United Arab Emirates on official visit, in Abu Dhabi met once again with the Minister of State of the UAE Sultan Al Jaber to discuss prospects of cooperation in different areas. 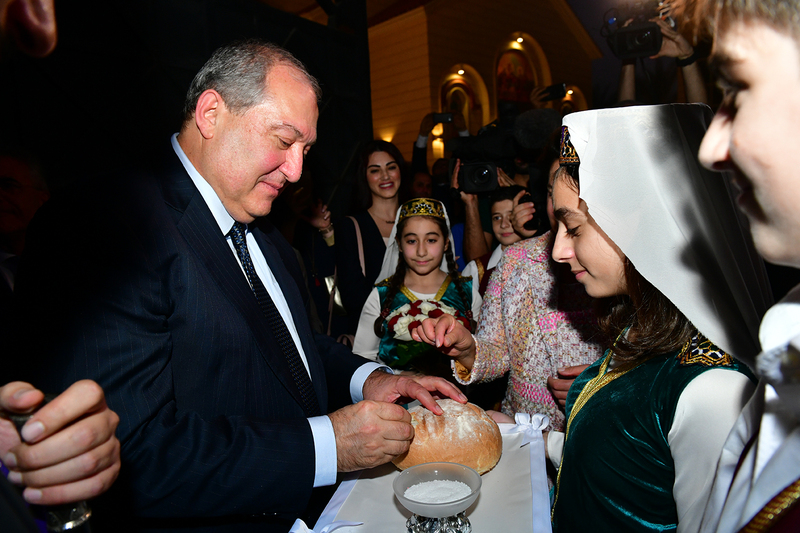 The President of Armenia noted that Armenia is a small country but Armenians are a global and largely interconnected nation. 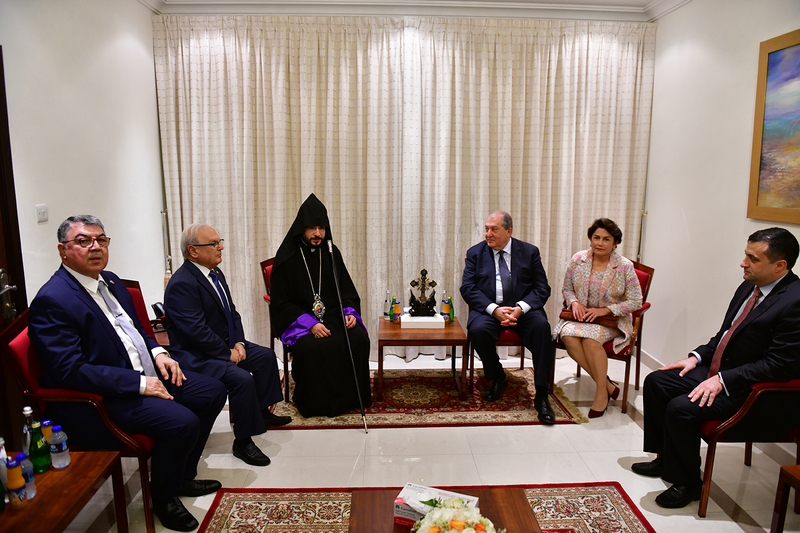 And he, as the President, is speaking about cooperation not only with regard to the Republic of Armenia - Armenians and Armenian businesses are everywhere in the world and because of that potential for cooperation increases manifold. 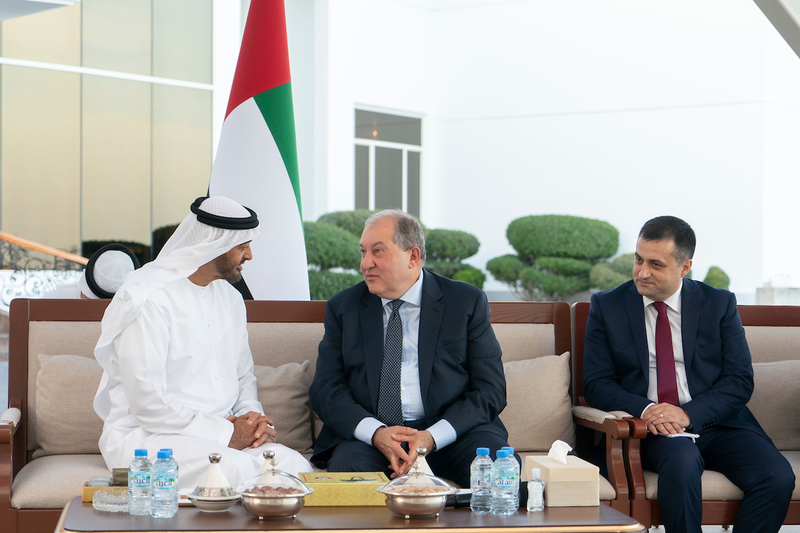 The interlocutors agreed that as the first step a UAE delegation will visit Armenia to familiarize firsthand with the opportunities, hold discussions, and put the existing proposals on practical ground. 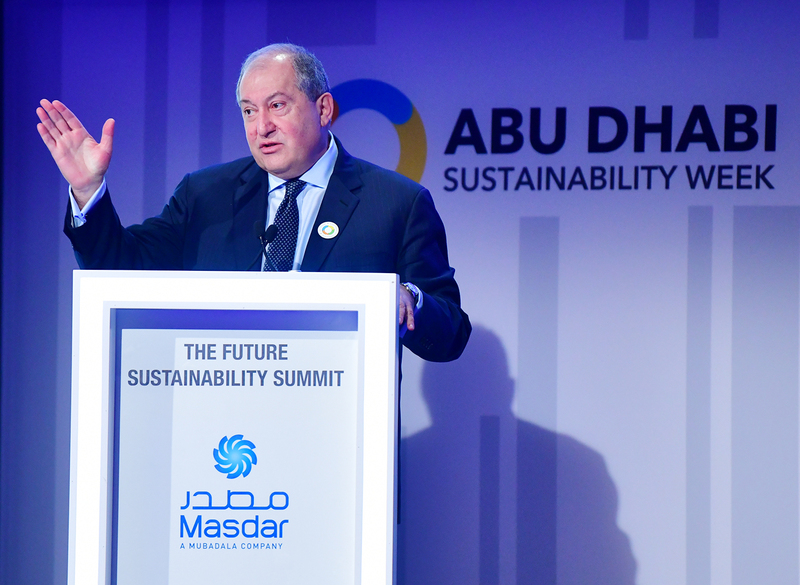 President Armen Sarkissian, who is in the United Arab Emirates on official visit, visited today the innovative Masdar City. Masdar City is a town built in Abu Dhabi. 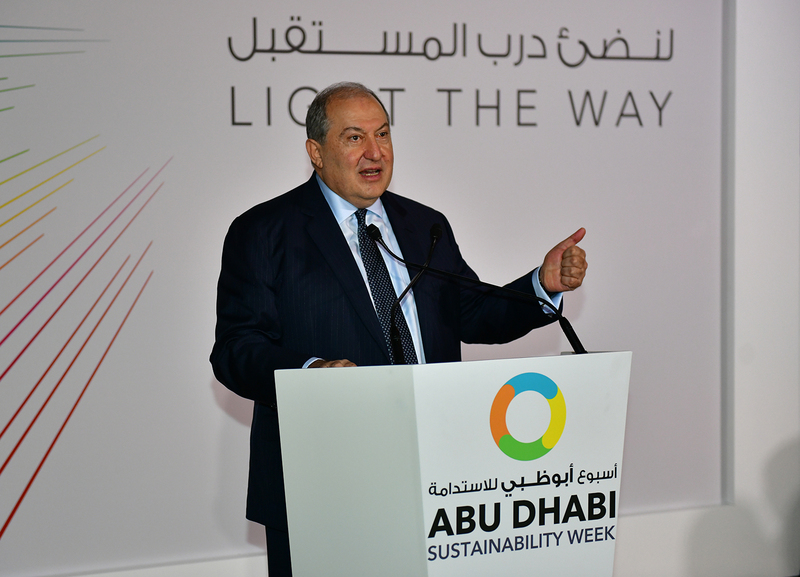 It is often also called the eco-city of the future which will be functioning exclusively on solar and renewable energy. 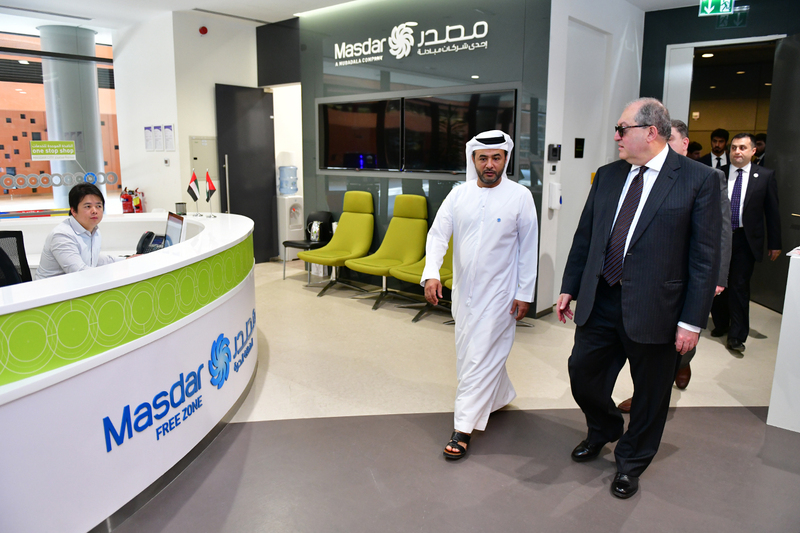 The development philosophy of Masdar City is based on the principle of maintaining economic, social, and ecological sustainability. 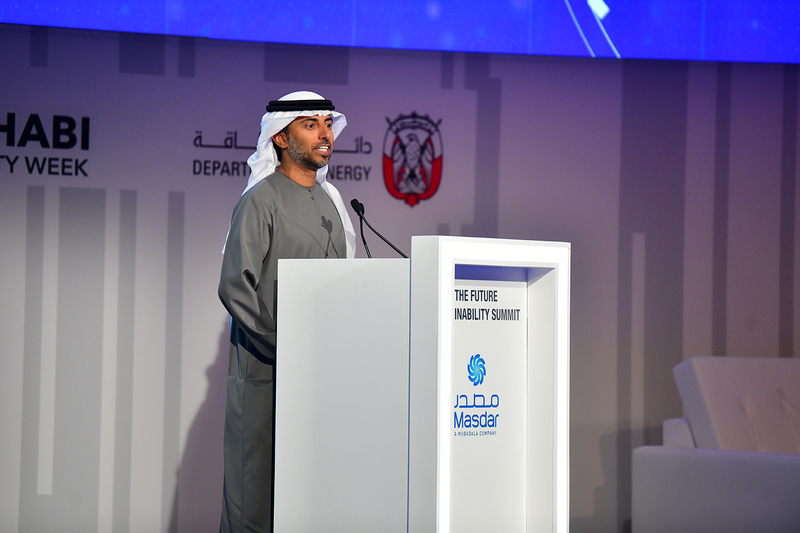 Through the reduction of refuse volumes, use of water resources, and introduction of new solutions to promote energy efficiency, Masdar has become a model for urban development. 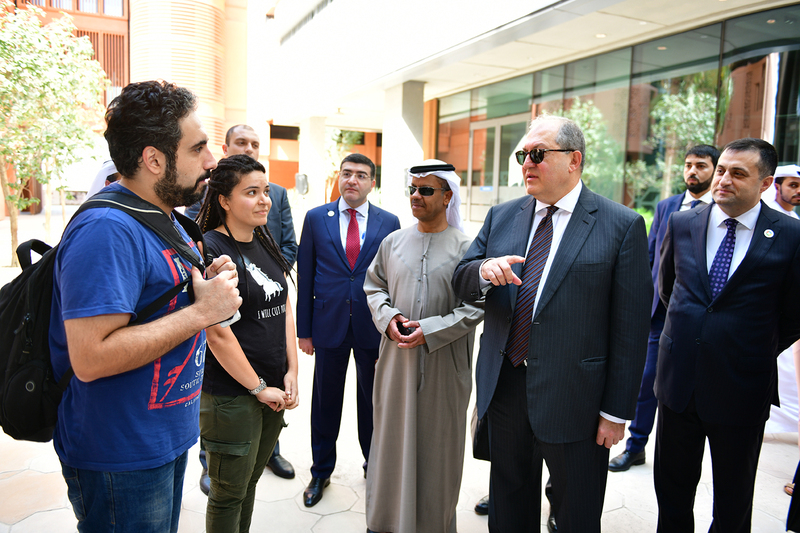 At the same time, the Masdar complex of technologies and education, in cooperation with the Massachusetts Technological Institute, opens educational new prospects for students from different countries, including Armenia. 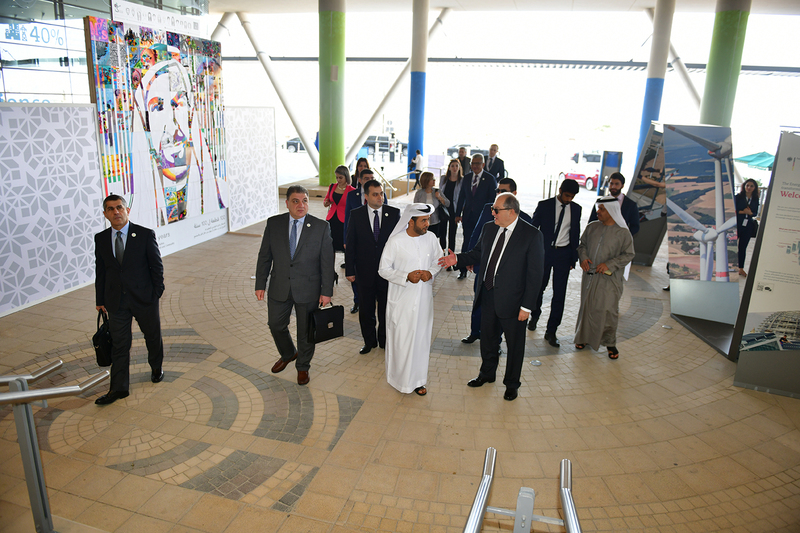 Accompanied by the Chief Executive Officer of Masdar City Yousef Ahmed Baselaib, President Sarkissian toured the territory of Masdar, inquired about the projects and programs of the innovative center, prospects for their implementation, and applied innovative ideas. 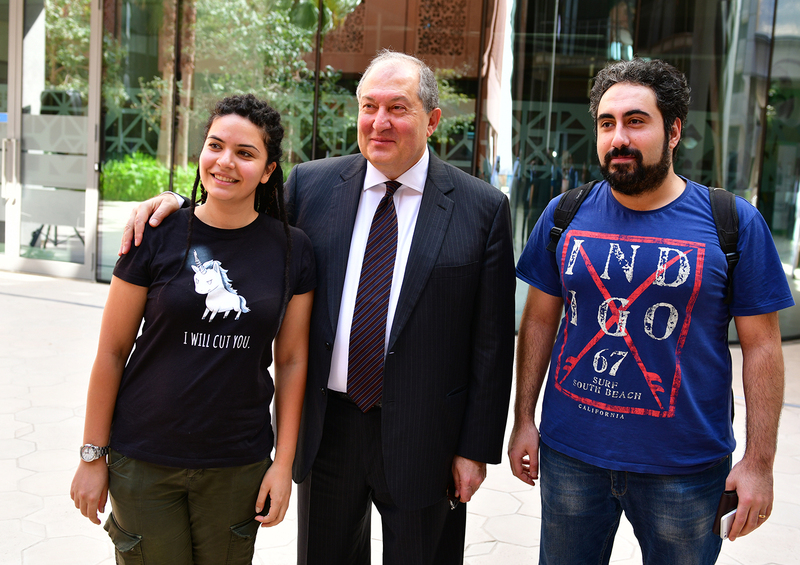 President Sarkissian in Masdar met also with the students from Armenia Maria and Arik, asked about their study progress and programs for the future. “This is not just a city but rather a composition of different ideas and approaches. This is a city, as well as a research and educational center, at the same time business and foundation. This is also a huge investment. There were times when we had 10-11 students from Armenia here. Unfortunately, right now they are just a few, only three students. 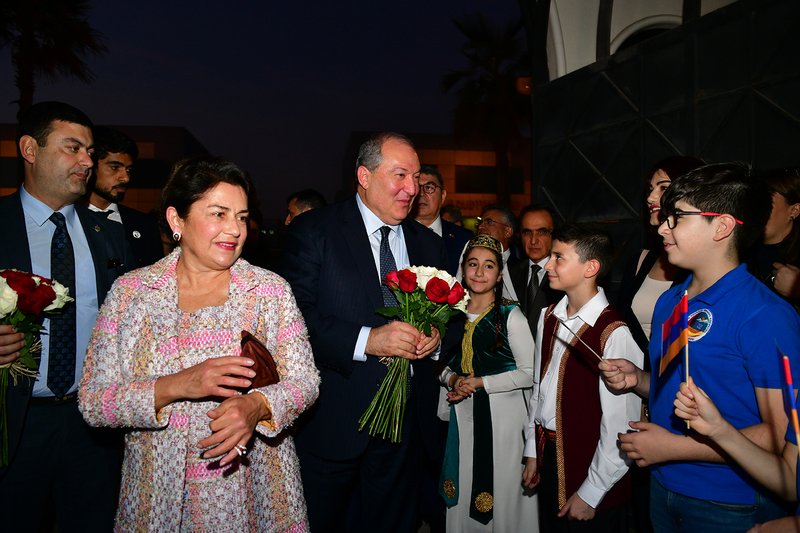 If managed efficiently, in two or three years these students can come back and implement the same ideas in Armenia,” President Armen Sarkissian said and underscored that in the 21st century, in which we live, such ideas will be in high demand. 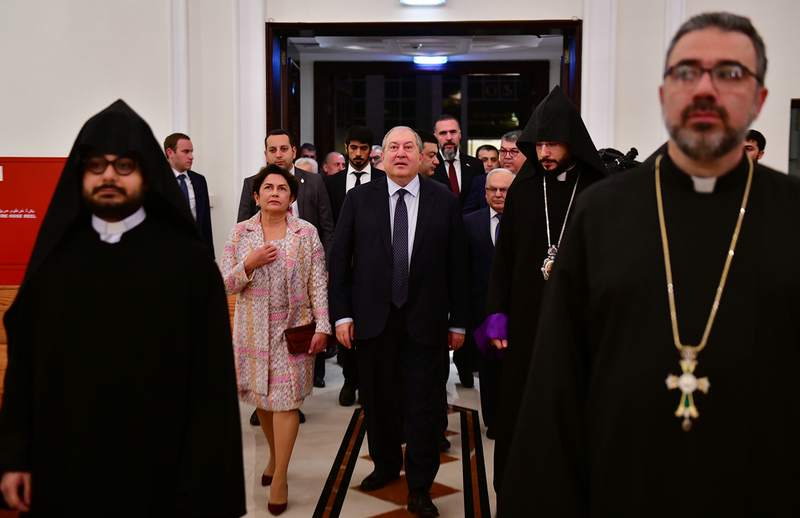 “I believe, this is a good example of a center which we will definitely cooperate with and create the Armenian version of it, which will not replicate it but will be even better,” President Sarkissian said. 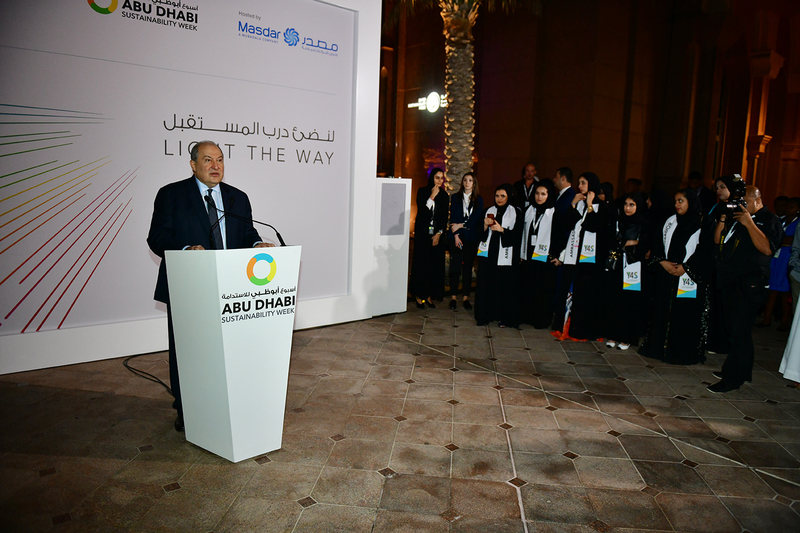 Responding to the questions of the journalists, the President of Armenia shared his vision of the future city. 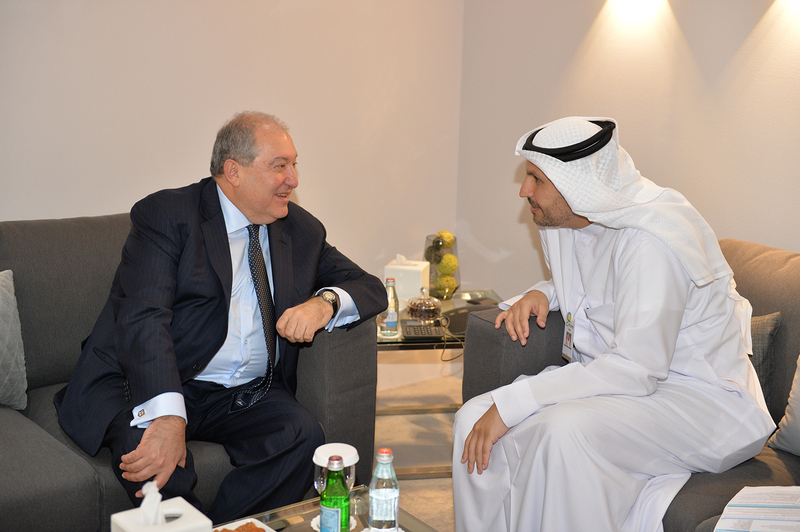 President Armen Sarkissian met in Abu Dhabi with the founder and Chairman of the ALNOWAIS Investment company Hussain Al Nowais. 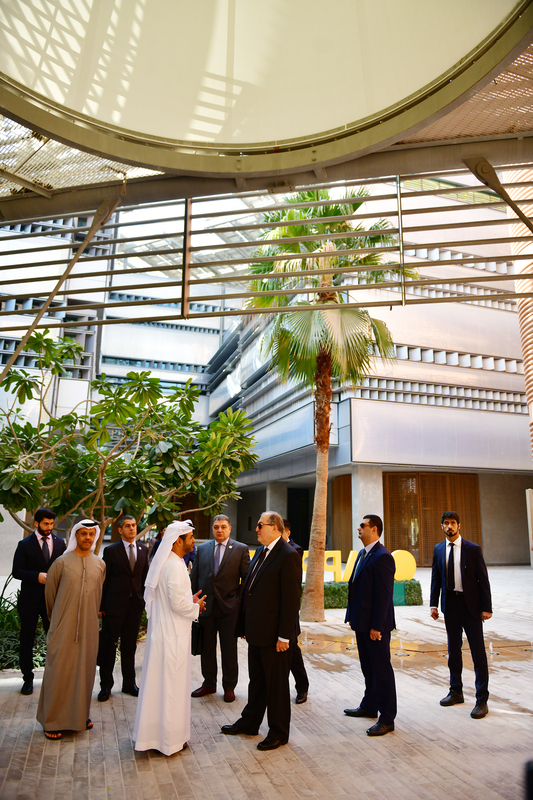 The company is active in the hotel and real estate, infrastructure and energy areas and has a great experience in the implementation of different projects in the area of renewable energy. The Chairman of the company said that he was interested in cooperation with Armenia, particularly in the implementation of joint programs in the area of renewable energy. At the meeting with the President of Armenia, the agreement was reached to conduct a visit to Armenia shortly to learn firsthand about the opportunities existing in Armenia and work on concrete programs. 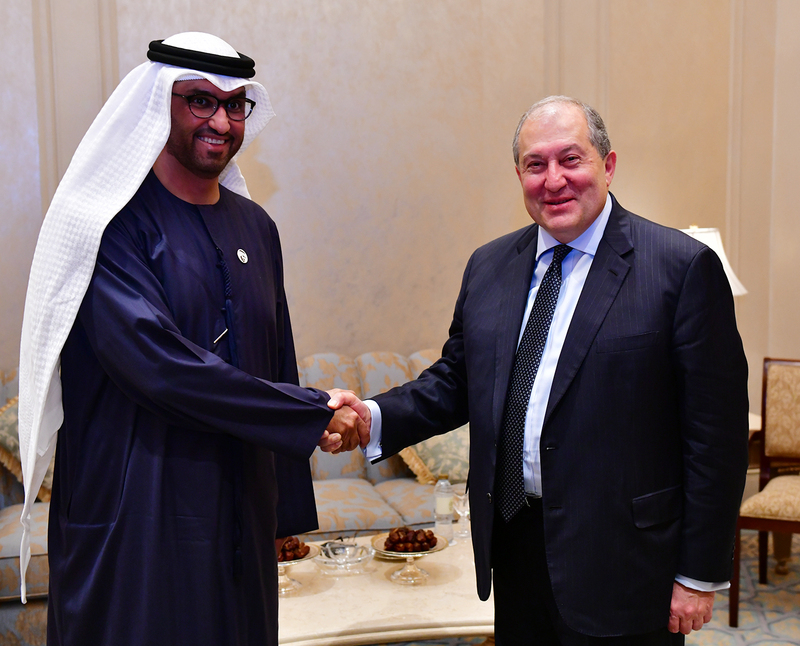 President Armen Sarkissian, who is in the United Arab Emirates on official visit, met today with the Managing Director of the MUBADALA investment company Khaldoon Khalifa Al Mubarak. 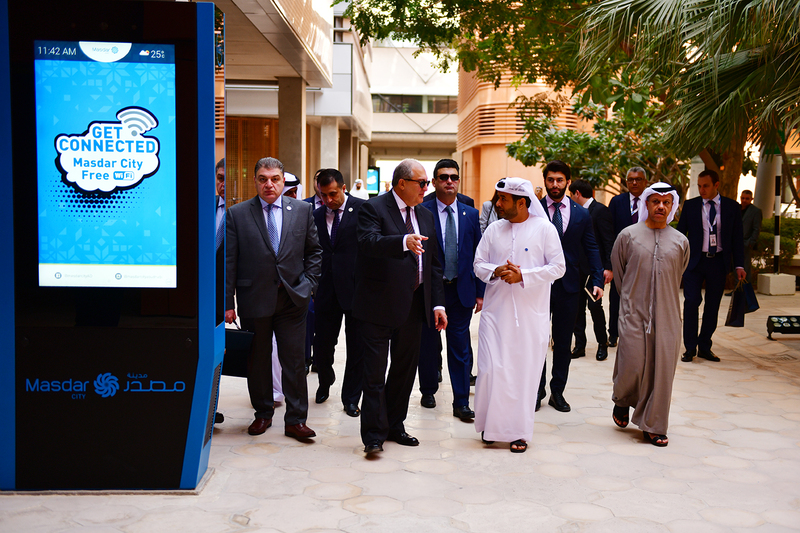 The MUBADALA investment company is working mainly in the areas of high technologies, telecommunications, energy, health care, real estate, infrastructures, education, and science. 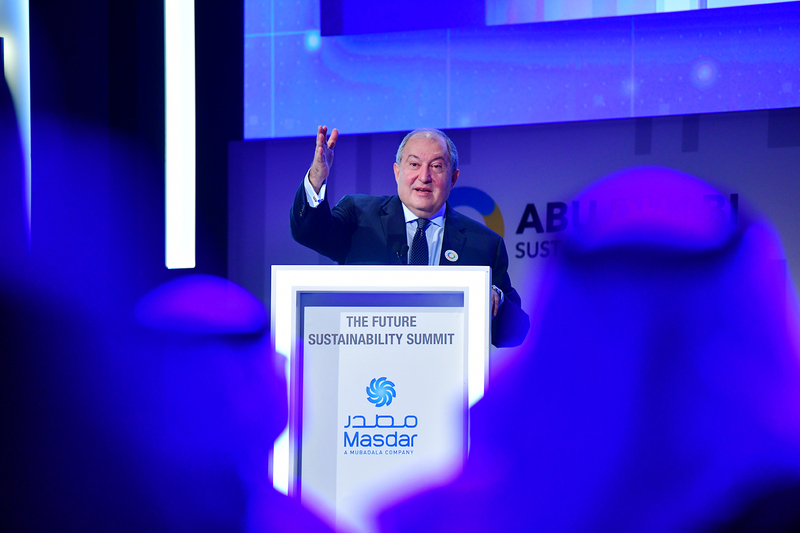 President Sarkissian expressed gratitude for granting stipends to the Armenian students to study at the MASDAR educational complex for technologies and science and expressed hope that the process would be of a continuous nature. 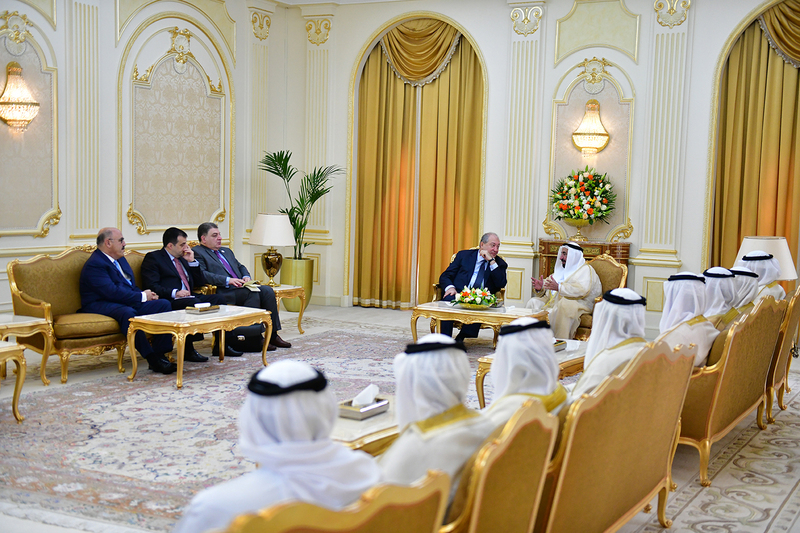 The interlocutors discussed in a warm and cordial atmosphere issues related to the cooperation of the two countries in the areas of trade, economy, and investments. 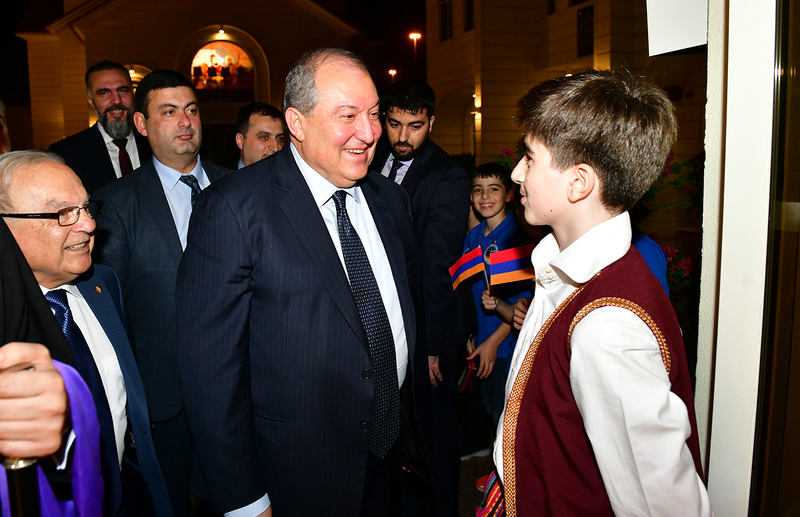 As promising from the viewpoint of investments, the President of Armenia suggested to look into the areas of renewable energy, telecommunications, tourism, hospitality and service areas, which, in his words hold a great potential for cooperation. 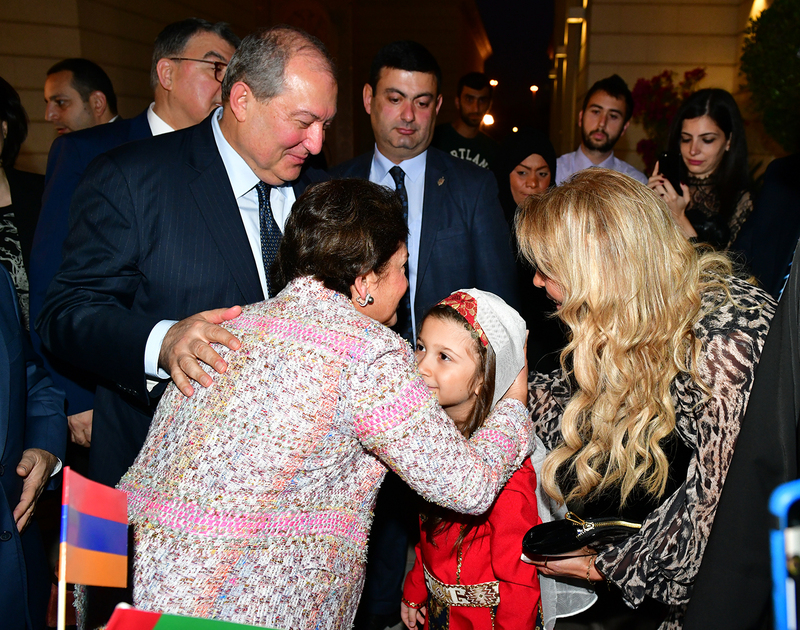 President Sarkissian proposed also to conduct a familiarization visit to Armenia to learn firsthand about the existing opportunities and to work on programs of cooperation. 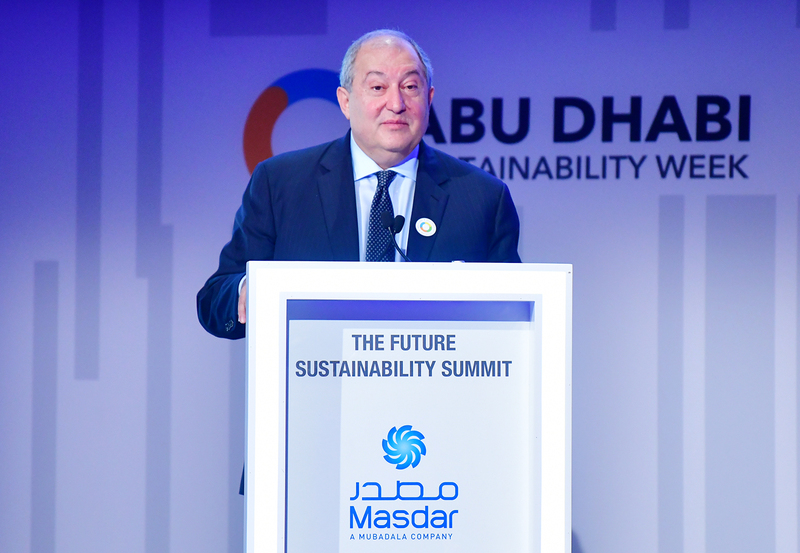 President Armen Sarkissian, who is in the United Arab Emirates on official visit, at the capital city of Abu Dhabi in the framework of the Abu Dhabi Sustainability Week forum participated today at the Future Summit conference. 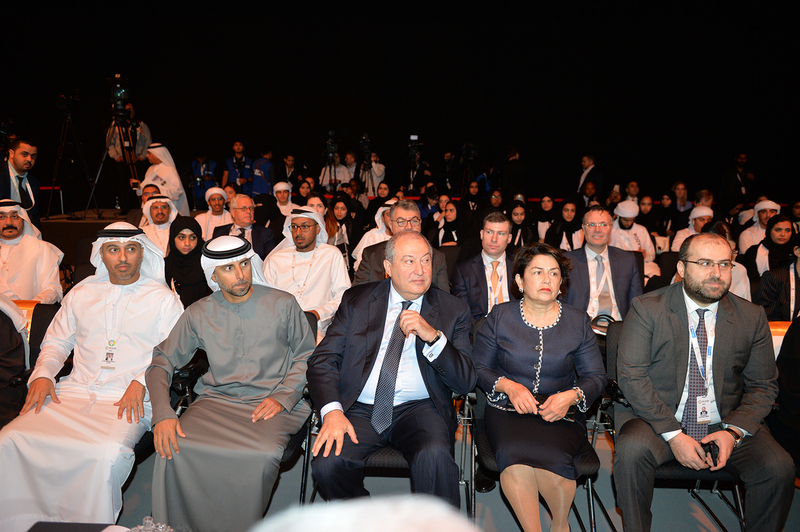 The conference was opened by the Minister of Energy and Industry of the UAE Suhail Mohammed Faraj Al Mazroui. “This is a special conference, and it is no accident that it’s happening right here. 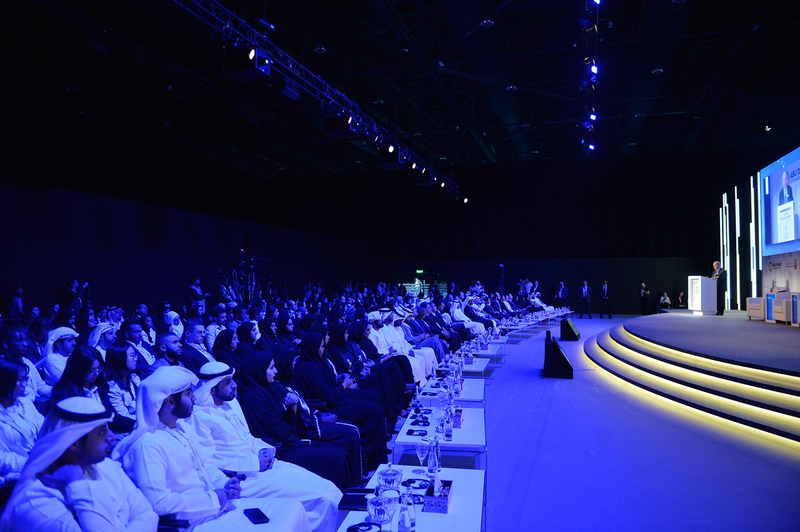 It testifies to the fact that the government led by Sheik Mohammad Bin Zayed, looks towards the future. 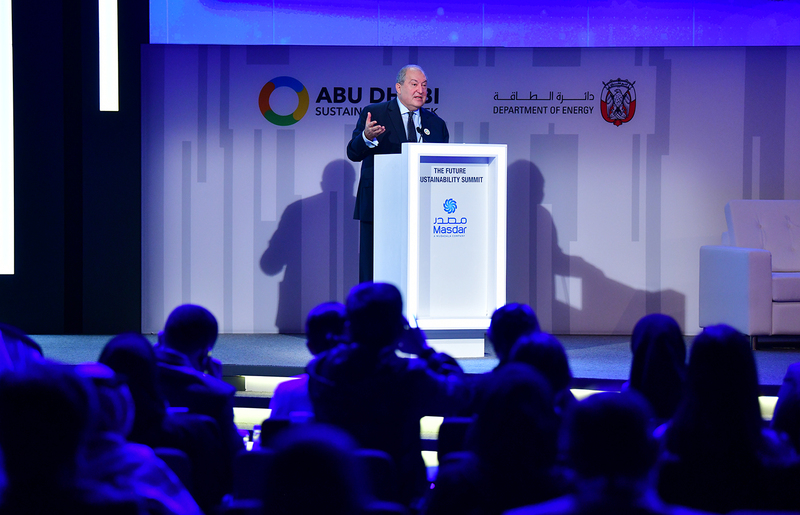 Issues raised here are linked to the future and potential challenges, risks, which we will face tomorrow, starting from food, water, climate change, and to energy. If we go back historically one hundred years, we will see that were living in the world of energy industry, which we could call “black” because we were burning coal, oil and received energy which was used in industry and so on. Later, we learned to use renewable energy and started to use also gas. Today that “black” has become “gray”. However, we all expect to have a world which is not gray but green. The road from the today’s gray world to the green world of tomorrow is time consuming, will require hard work, and efforts. Everyone is talking about the climate change. I would like to note that we need to be very careful to discuss not just climate changes but also their impact on the nature. The best example is atomic energy. Even though the impact of atomic energy on the climate is minimal, it creates atomic fuel, atomic waste which are to be dealt with. We are using only a small part of the created atomic fuel. We need to deactivate or store it for the future generations. Atomic waste, which is radioactive, presents another problem. Thus, we need to be very careful to understand what to do with it because it can pose a threat for the nature for a long time. On the road from gray to green, to a bright future, huge work is to be done. We have great opportunities for renewable energy but using it, we need to be very careful not to harm the nature. Along with problems, allow me to talk also about advantages and about where we are today. I will focus on two issues. First, I would like to talk about globalization. It is very important in our life. The impact of globalization started after the collapse of the Berlin wall, when barriers between the East and the West, between ideologies collapsed. The second impact took place when the world realized that there was only one important road towards the future. It is the capitalist way of governing, free and liberal markets. It became the reason for the establishment of the interstate relations and international institutions. It also resulted in a huge flows of labor, energy, and money from the West to the East. Production was done not only at the USA but also in Vietnam, China, India… The world turned into a global market. The second important point: Years ago, different parts of the world were connected through lines, through telephone lines. But today we see that the world has become a small place interconnected through a huge web of nerves. This planet is interconnected. Today, it is quite possible to call people in California or Australia and to see people in real time, to have discussions, while 20-30 years ago such possibilities didn’t exist. It happened because of globalization, technical globalization. Globalization started as a macro process but has gone very far and has become a micro globalization. I call it globalization at the quantum level. Even if we introduce certain limitations, we cannot stop the flow of ideas and startups which have become the new driving force for industry. It means that obstacles can appear at the macro level but the new industry of information technologies, artificial intelligence will never stop. It is impossible to stop the world’s quantum globalization. The second issue I would like to talk about is industrial revolution. If we go back some one hundred years, we will see that dramatic changes took place on our planet. It was that huge development which took place in physics. Before that we saw everything in the light of the laws of classical physics and mechanics created by Isaak Newton and many other scientists. Everything was possible to explain. But in the end of the 19th century and the beginning of the 20th, new events took place, scientific new discoveries which are impossible to explain through the laws of classical physics. As a result, geniuses such as Albert Einstein, created the theory of probability for great segments- astrophysics, gravitation theory. Those brilliant scientists created the quantum physics. It was not just a discovery of a new quantum physics: It was a revolution in thinking and logic. These geniuses looked at the reality and changed it, revolutionized the entire perception logic of material things. Certainly, at the beginning the scientists were startled because everything was illogical. However, when logic and approach are changed, one starts to comprehend that everything becomes logical under the new ideas. It is very important for revolution in science. Another issue I would like to mention speaking about industrial revolution is the following: What we are talking about, is not the fourth industrial revolution. I would characterize in other terms. In contemporary natural sciences – physics, mathematics, chemistry – great achievements are taking place, and they are based on artificial logic. 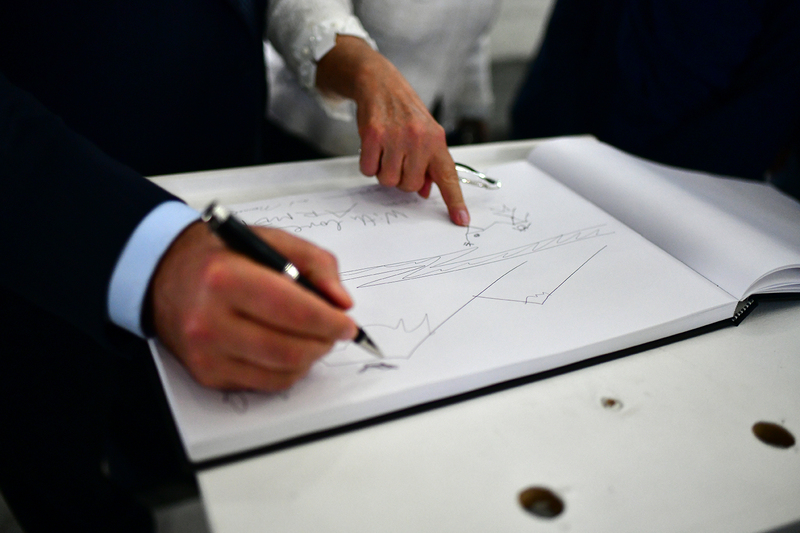 Any research is based on the data and the way we work with it. Today we have technologies which scan human body and as a result there is much information. No doctor can work with the entire compound of that data but when we use artificial logic, computer systems, which can make analyses and learn, these systems can within seconds analyze all information and to advise doctors. Artificial intelligence will help us to better understand our DNA as well as to change it in a way that we can live longer and healthier and overcome diseases such as cancer. It is no accident that there are already achievements. Last year, the Noble Prize in medicine was awarded to two individuals who found solutions to treat some types of cancer. But it was a result of years-long hard work and use of artificial logic. Artificial logic becomes the brain of the industrial revolution. I would like to stress one important thing: there is no the fourth industrial revolution. What we face today and what the young generation will face tomorrow is a permanent revolution which will be taking place every day. It is based on huge knowledge in the area of science and technologies, however its driving force is artificial intellect. Those countries or companies, which invest in artificial intellect, are on the right path because together with the knowledge we already possess, it will change dramatically the world as well as the way we are trying to solve problems, including problems of food, water, and energy. It will also change the way people work. For instance, doctor’s work will be very different because artificial intellect will advise doctors. Work of lawyers and others also will be different. Some jobs will disappear but other will appear. And they will be based on innovations. We are living not in the century of great industrial companies but in a century when young innovators and startup rule the world. Look at the major world companies. Are they great oil companies? No. Those are the companies which started in garages by young innovative people and became billions-worth companies which rule the world. Our problems will find solutions linked to new types of industrial revolution. I call it fast evolution with the exponential growth. We will be seeing evolution every day. The young generation will be living in a wonderful world, a world where their abilities and talents will be recognized as well as their innovative power. This revolution, globalization will influence our everyday life. We see it everywhere. Events that are taking place in the world seem to be a little unpredictable, unorganized. Those are results of evolution and a new quantum world. For example, event which took place in France, the election of President Macron, who came as a result of youth movement and won the elections. Events in Britain, where emotions and the society, Facebook created the Brexit movement. US President Donald Trump is an excellent example of how it is possible to make politics in the 21st century without mass media, addressing directly to the voters, to the people. Nearly one year ago, in my country, when I was inaugurated as president, a couple of weeks from that there was a demonstration led by a young journalist, that started at the north of the country with a couple of people, turned into a demonstration with 100, 1000, 5000, 10000 people. Eventually, we had 200000 people on the Square and in two weeks there was a revolution in Armenia. All this took place because the world is globalized, because we are interconnected, everyone has a page in Facebook. So, it is not necessary that a political party causes great changes in a country or in the world in general. So, welcome to a new, global world where you will live. Welcome to a new world of quantum behavior where classical methods of doing business, development of ideas even politics are not efficient any more. It is necessary to be very inventive. A couple of words, or just an advice for young people. For me, being young is not about the years you spend on this planet, but it is related to how young you feel inside, if you have enough energy, if you’re interested in what’s going on. If I were to give an advice to my grandchild, whose name is also Armen, I would say, dear Armen, I am not going to advise you to be a doctor, a lawyer or a farmer. Maybe, 30 years’ time there will be very few doctors of lawyers. First and foremost, I would advise you look inside yourself, find who you are because every child born has a talent. Once is gifted in mathematics, second in music, third in arts, fourth in story-telling, fifth is a politician another has a talent of listening to others, or giving them advice. So, the idea is not what to become, the idea is discover who you are. The second thing I would advise Armen, is the following: find your life mission. If you’re talented in music, you need to have a mission, to become, for instance, the best violinist. Find your life’s mission and not just job. The mission which is the passion of your life. It’s part of you, and these two should be in harmony with each other. Next, think about your life in the 21st century, think about your life as a startup. You have to create your own startup which is named Startup Armen. Make yourself as a professional, one who can create. Certainly, don’t forget that it’s a hard work which must be done diligently. Don’t forget that there are historical values, values of your nation and your family. Don’t forget that in order to achieve something, you need to stay young all your life. Remember that being young is not about years spent on this planet: It is about having a young spirit. If you learn something new every day, just like children, you will stay young. Even if you are eighty years old but continue to learn and wonder at the world, make plans for future, it means you are young. Of course, there will be difficulties in your life but you need to be brave. Which each day before your success, you need to prove that you deserve what you achieved. After each failure or disappointment there should be no depression. Just stand up and move on. You have a wonderful life ahead of you and this new world is a quantum world. Don’t worry and don’t be afraid just as scientists one hundred years ago were not afraid. They went through a serious drama, tragedy because they didn’t understand who this universe was working but they changed their approaches and logic, they became innovators, started to think of the world of physics in quantum way, and everything became harmonious and clear. Look at your life, at the 21st century, at the industry, business and politics from a new point of view. Rediscover this world, the logic will be different. This is a quantum world, it is not classical, but when you understand how it works you will be in harmony and will be successful. So, good luck, and good luck to all of you. 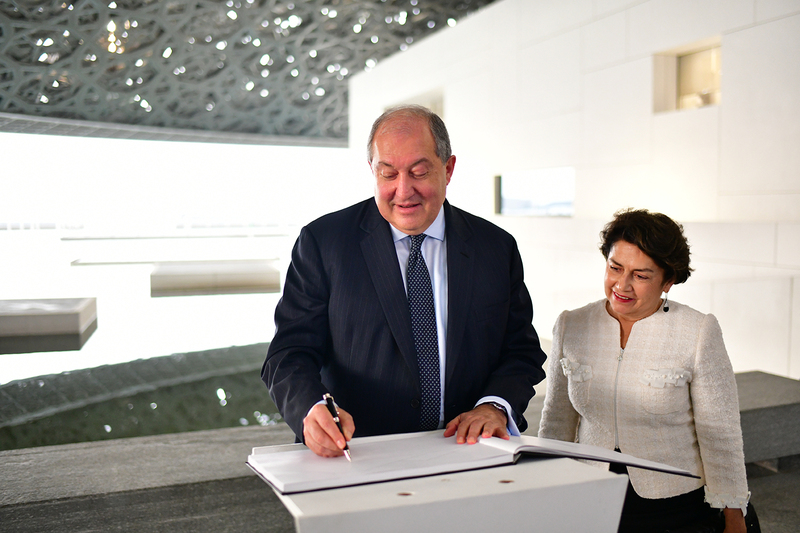 In the framework of his official visit to the United Arab Emirates, President Armen Sarkissian and Mrs. Nouneh Sarkissian visited today Louvre Abu Dhabi Museum which was opened in 2017. 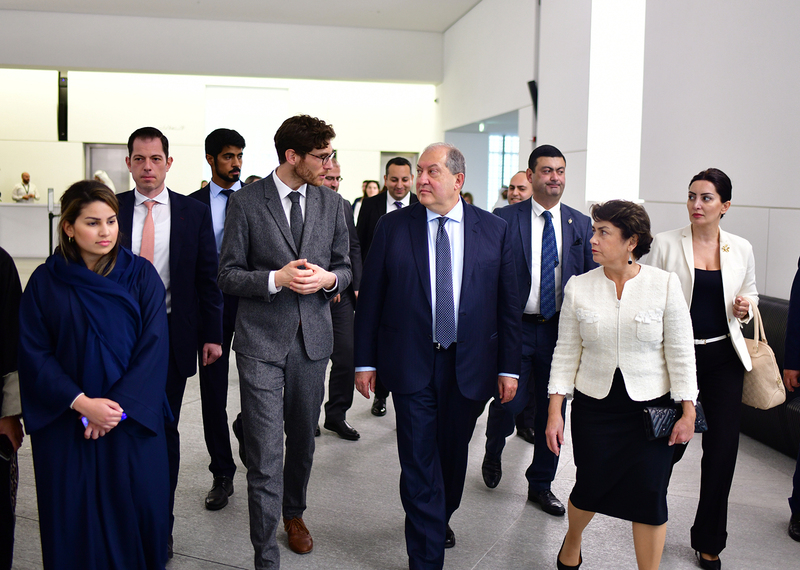 President Sarkissian and Mrs. Sarkissian toured the twelve halls of the museum where the history of world art is presented from the ancient times to modern days, observed the exhibits and artifacts. 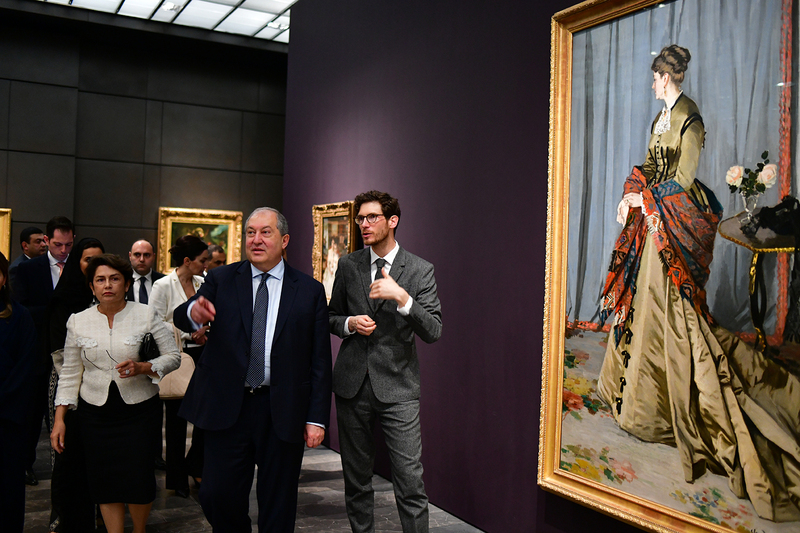 In the museum presented are also exhibits borrowed from Louvre, Centre Georges Pompidou, Versailles, Rodin Museum, and National Library of France. 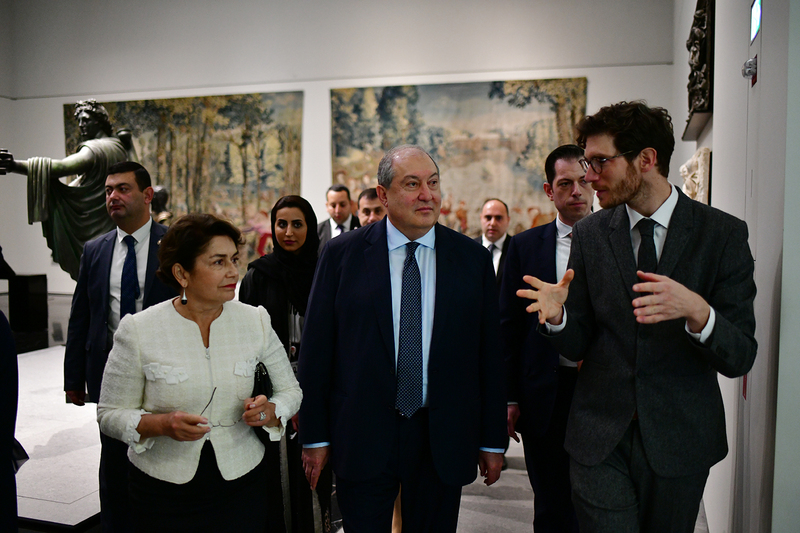 After the tour, in the conversation with the journalists President Sarkissian noted that he was very impressed and that Louvre Abu Dhabi is a special museum. 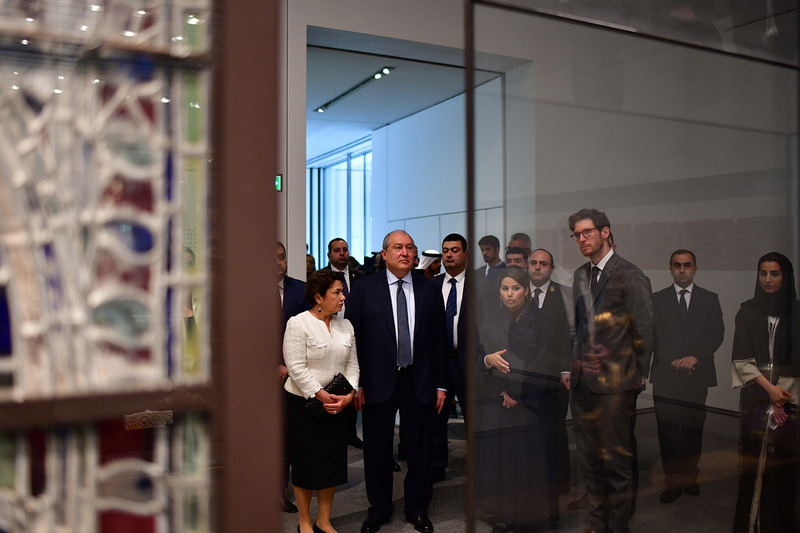 “The Armenian art should certainly be presented here. 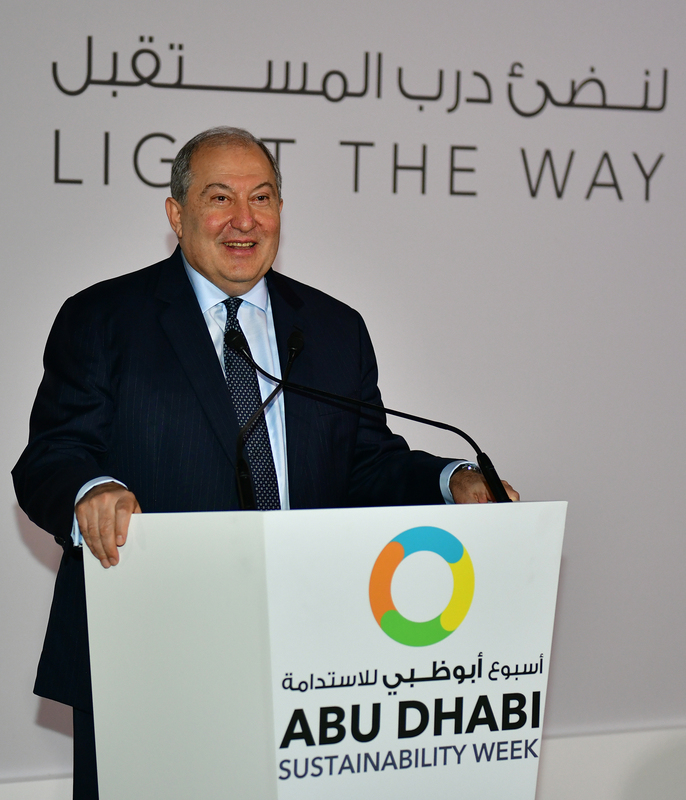 The management of the Museum is aware that we have had a splendid exhibition in Metropolitan Museum in New York dedicated to the Armenian cultural heritage and traditions,” President Sarkissian said and noted that the management of Louvre Abu Dhabi aspires to have a beautiful exhibit of the Armenian art in their museum. 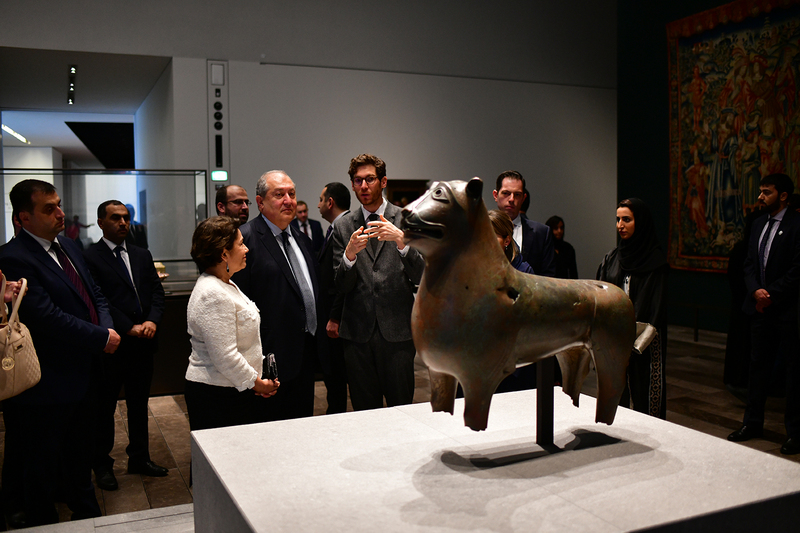 Mrs. Nouneh Sarkissian too had wonderful impressions and said that along with the exhibition, the museum stands out for its exquisite architecture and design. “Exhibits here are few and well-chosen. 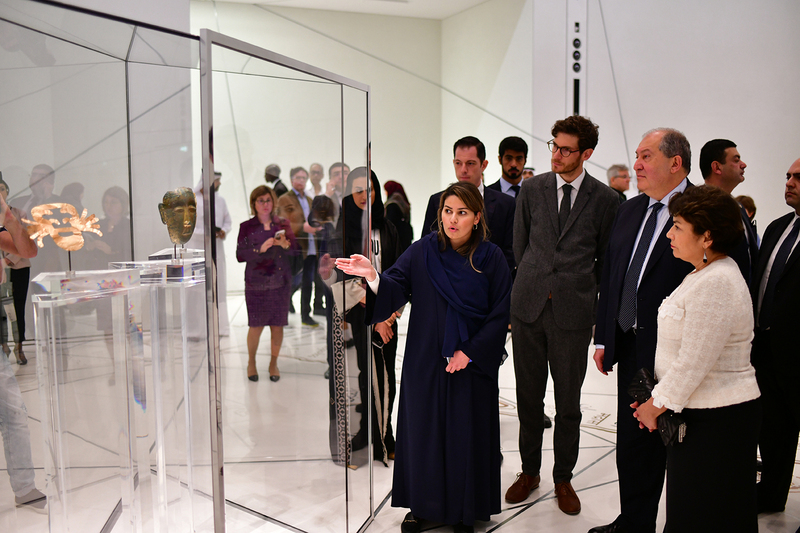 When a museum is not overloaded, it allows to see and understand better the historical periods and exhibits, especially during the first visit,” she said. 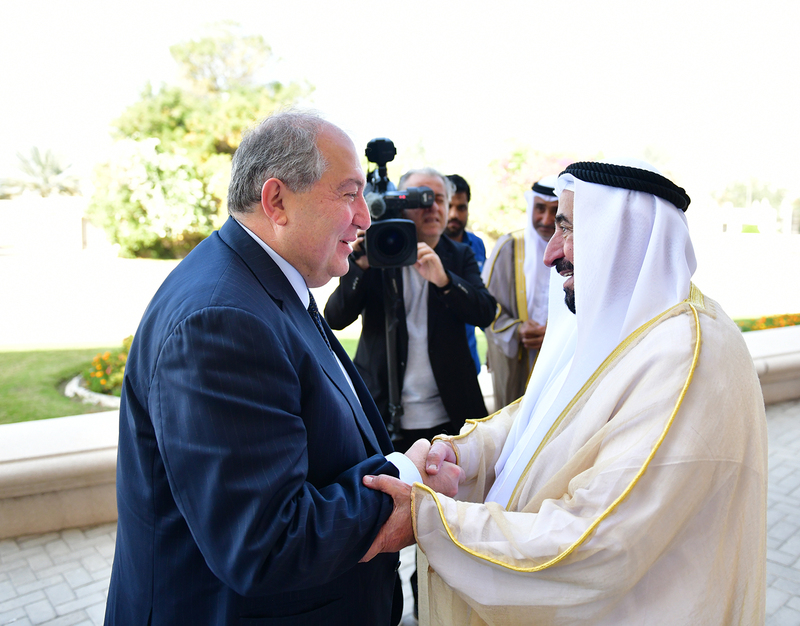 President Armen Sarkissian, who is in the UAE on official visit, met with the sovereign ruler of the Emirate of Sharjah, Sheikh, Doctor Bin Muhammad Al-Qasimi. 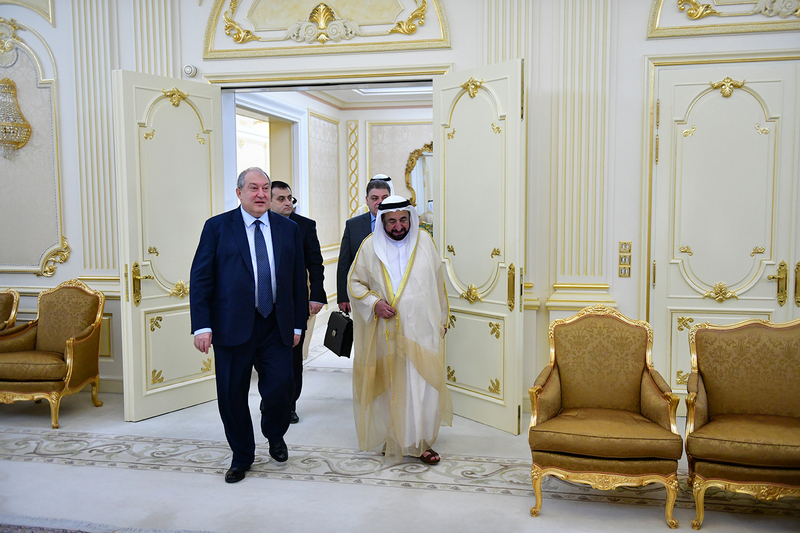 President Sarkissian hailed Sheikh Sultan Bin Muhammad Al-Qasimi’s warm attitude and special attention towards the Armenian people which is visibly manifested through the programs implemented through his support and donations. 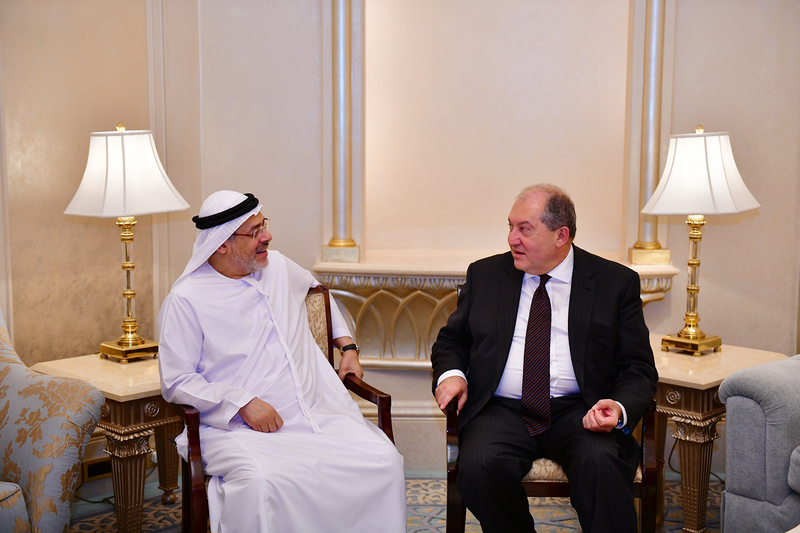 The President of Armenia and Sheikh Sultan Bin Muhammad Al-Qasimi discussed opportunities to expand the bilateral relations and stressed in particular the importance of cooperation in the areas of science, research, and education. “We are ready to further deepen and promote relations between our friendly states and peoples,” the President of Armenia underscored. 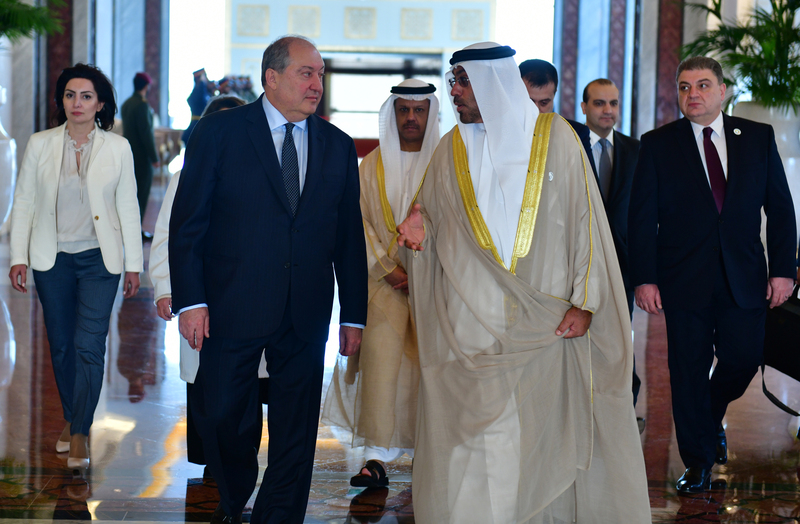 The parties agreed that a special group would be dispatched to Armenia to learn firsthand about the opportunities for cooperation and discussion of concrete programs. 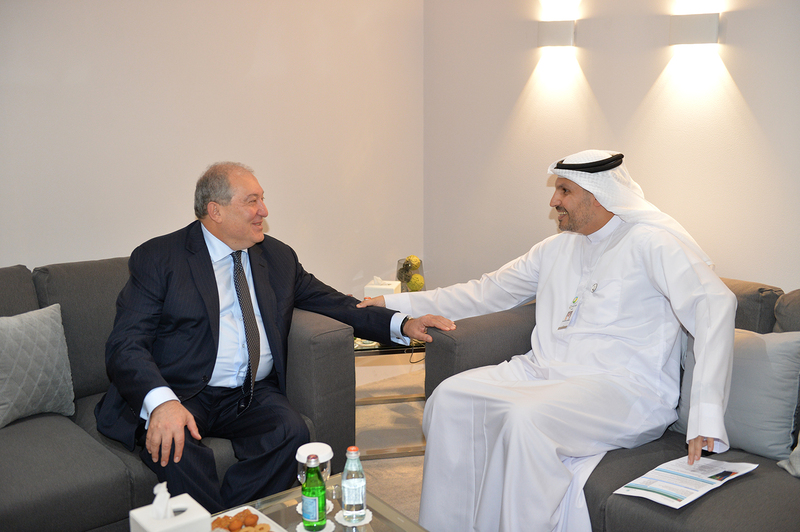 The also discussed an opportunity to sign an agreement on declaring a town from Sharjah and a town from Armenia sister-towns. 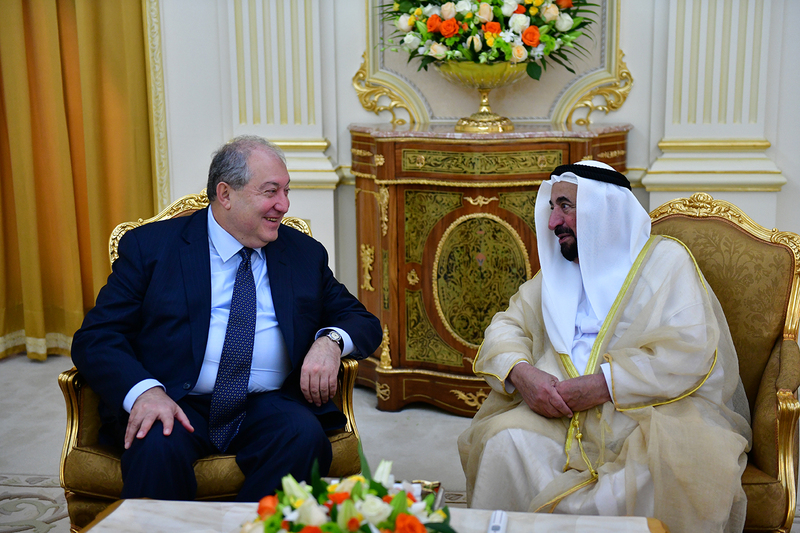 President Armen Sarkissian invited Sheikh Sultan Bin Muhammad Al-Qasimi to visit Armenia. The invitation was accepted with gratitude. 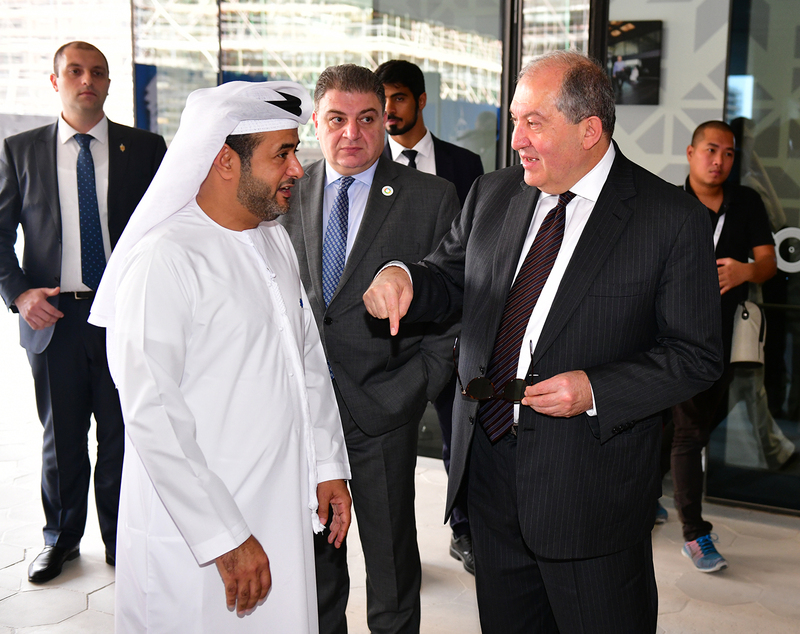 President Armen Sarkissian visited the Dubai International Financial Center (DIFC) and met with the with the Governor of the DIFC Essa Abdulfattah Kazim and the CEO Arif Amiri. At the meeting, the parties discussed issues related to the cooperation in the financial sector and in particular the necessity to fuly use potential existing in the Eurasian region. 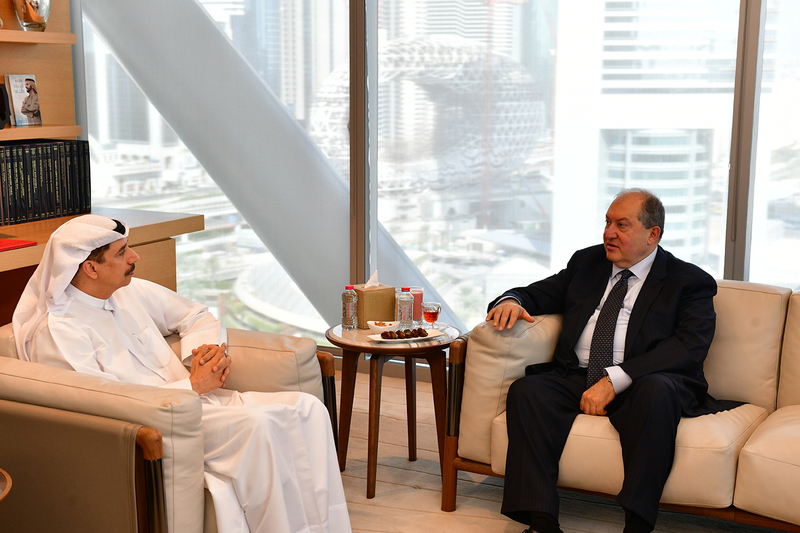 They also discussed the possibility of establishing in cooperation with the DIFC of an analogous structure in Armenia which will provide similar services. 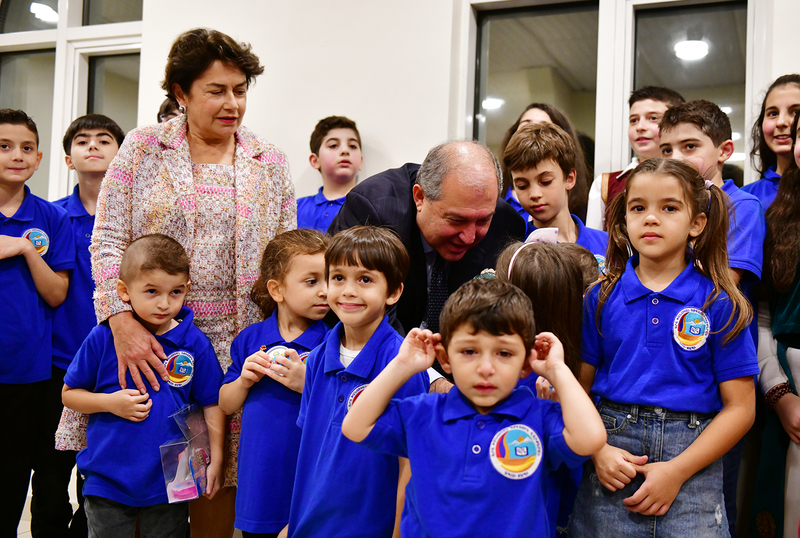 After the meeting, President Sarkissian toured the Center. 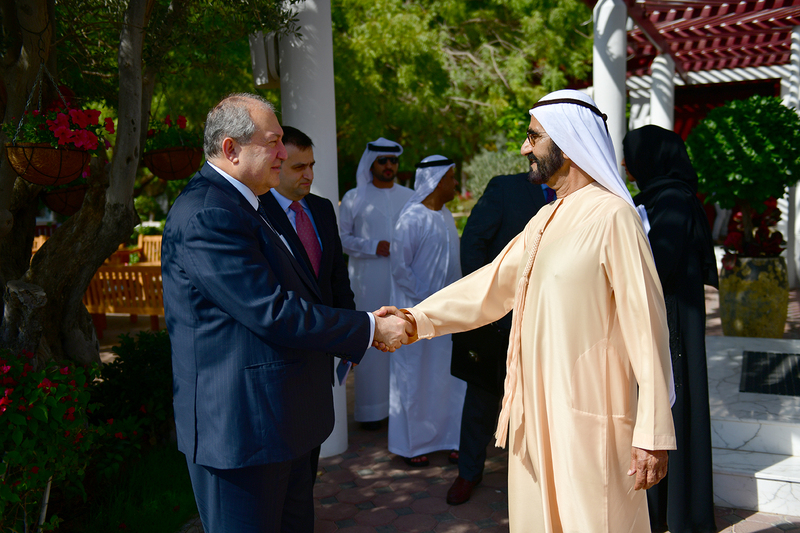 President Armen Sarkissian, who is in the United Arab Emirates on official visit, met today with the Vice President, Prime Minister and Minister of Defense of the UAE and Ruler of Dubai Sheikh Mohammed Bin Rashid Al Maktoum. 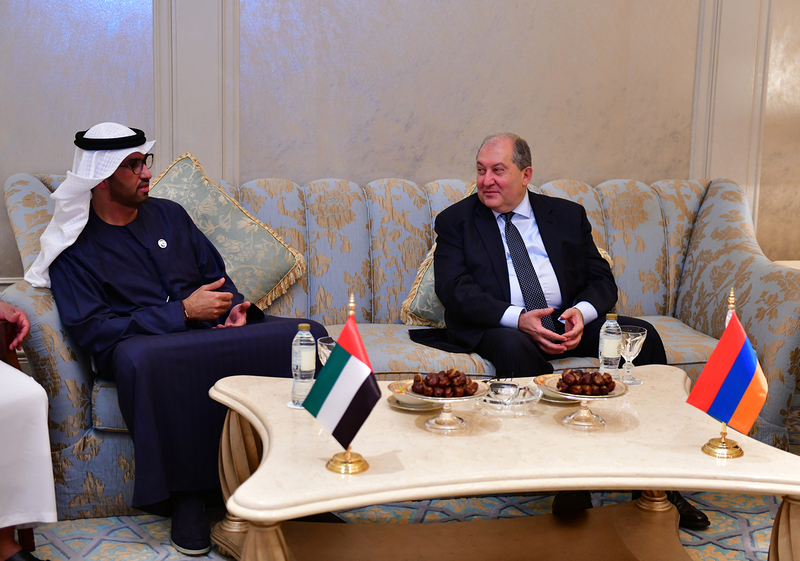 President Sarkissian and Sheikh Mohammed Bin Rashid Al Maktoum discussed in particular issues related to the expansion of business and financial cooperation between the two countries and stressed the importance of the steps aimed at the development of the tourism area. 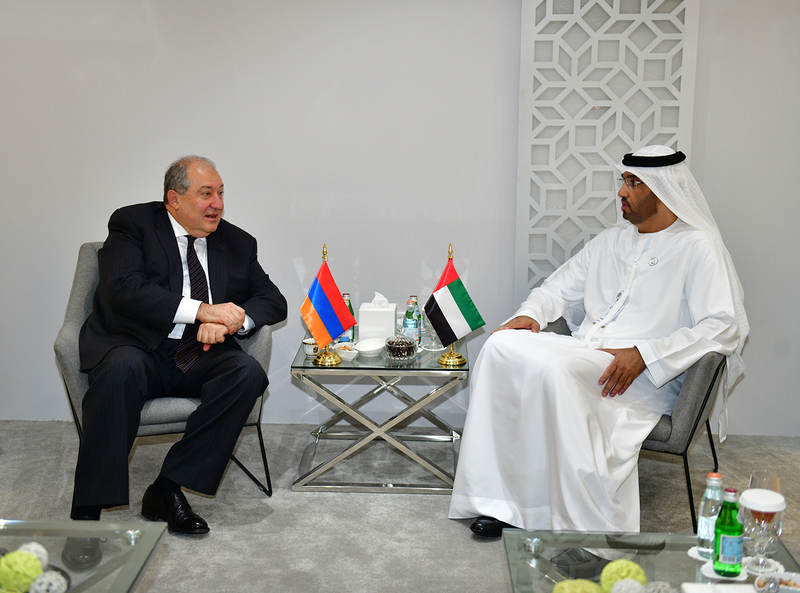 “We would welcome the interest of the UAE companies towards different areas of the Armenian economy and will assist the potential investors,” President Sarkissian underscored. 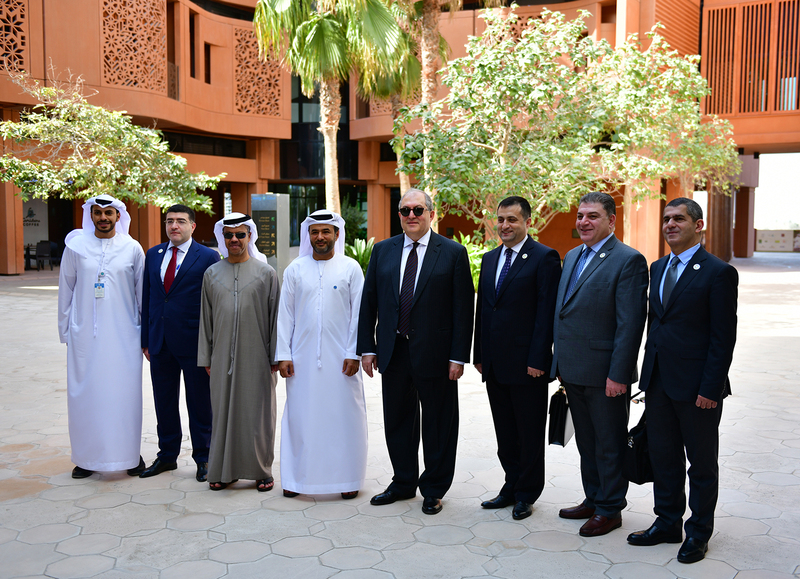 It was agreed that a delegation would be sent to Armenia to learn firsthand about the existing opportunities and to discuss possibilities of cooperation. 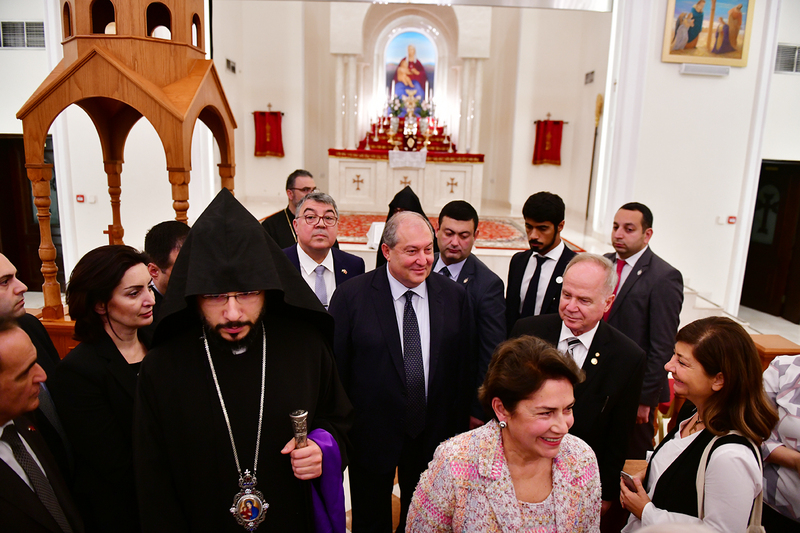 President Armen Sarkissian and Mrs. Sarkissian in the framework of the official visit to the United Arab Emirates visited today the Armenian Church of Holy Martyrs in Abu Dhabi. 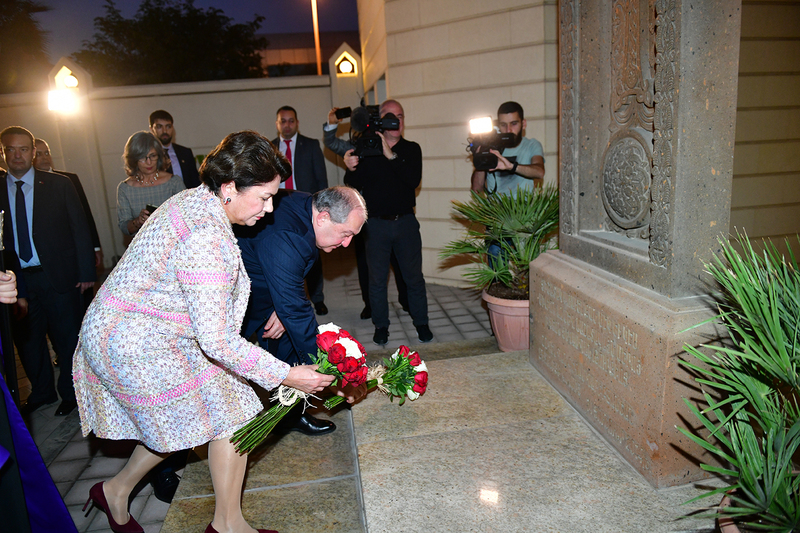 They laid flowers at the cross-stone installed in the yard of the Church dedicated to the victims of the Armenian Genocide and paid tribute to their memory. 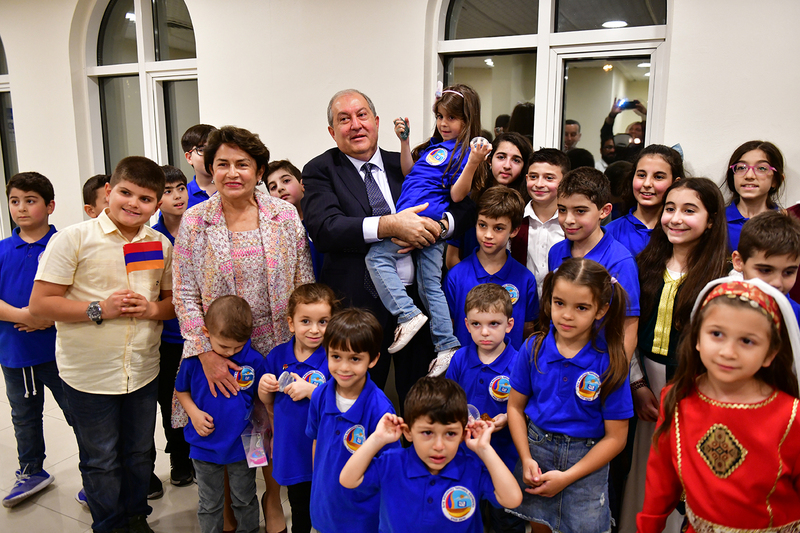 After a thanksgiving prayer, the President of Armenia at the Ara Khanoyan Sunday school met with the representatives of the Armenian community. 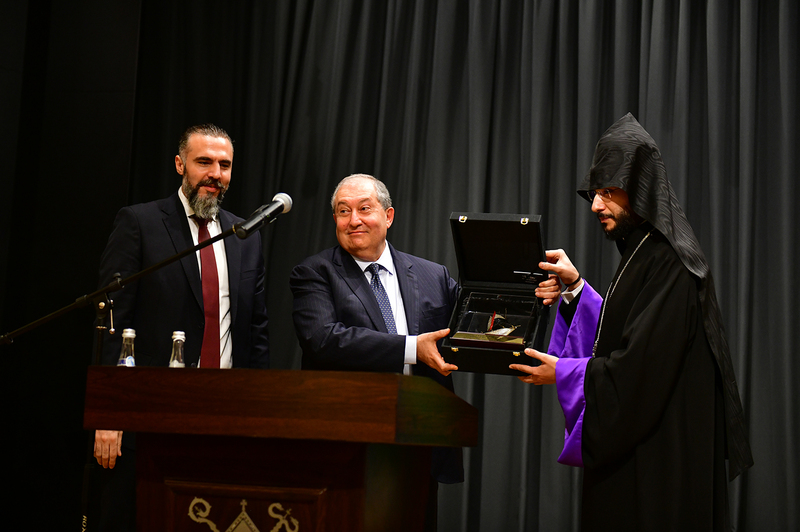 “Everything is gathered in one place – Armenian statehood with its flag and the coat of arms, the Armenian Apostolic Church, and certainly our future – the school,” President Armen Sarkissian said. 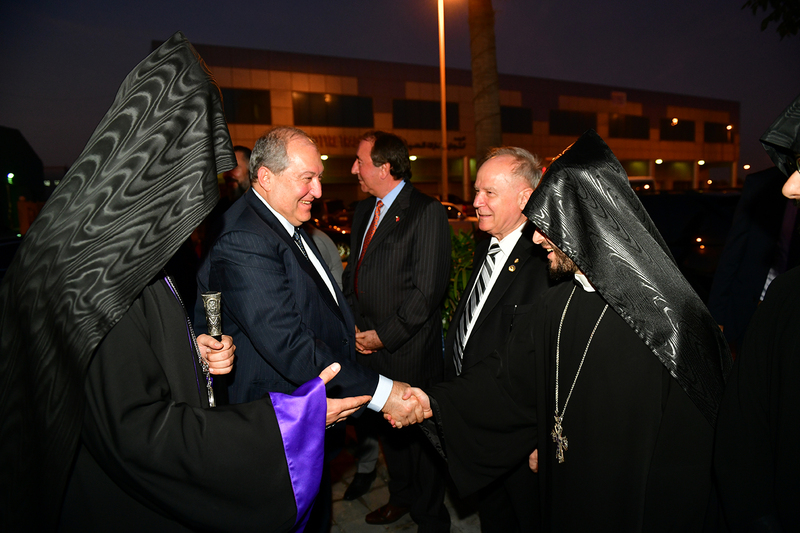 He thanked the Armenian community for its unity, dedication, patriotism and preservation of national values. “Together with you, I would like to see the day when we will forget the “Spyurk” word, and all will become Hayastantsi. After all, the Fatherland is the center of our lives, but I would like to share with you another idea. The fact that we are living in different countries of the world, are speard all over different parts of the world could be advantage rather than a disadvantage, because we are one of a few nations of the world that can state clearly that we are a small state, even two small states, but a global nation, very closely interconnected. We have created a small model of the 21st century because in the 21st century, the world population, regardless of where they reside – from Australia to Russia, from Europe to the United States, will be living like one family, family of the people. As the population is growing, the world is becoming smaller and smaller. It also becomes smaller because we all are interconnected. It becomes smaller because if 20 years ago someone would say that there would be changes in Armenia, developments, which you could participate to from a distance, many of you would probably say that it is impossible. But as you see, only 20 years later it became possible. 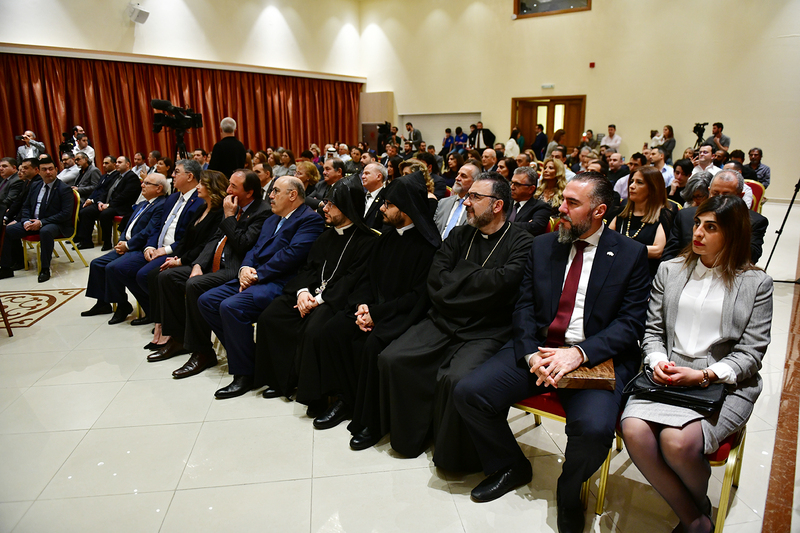 This allows all of us to think that our participation to Armenia’s life today is much deeper and opportunities are much wider. We are with our Fatherland not only in heart, spirit, and faith but many of you are also physically connected to the Fatherland. It can be through the internet or a virtual connection but it is still very important. 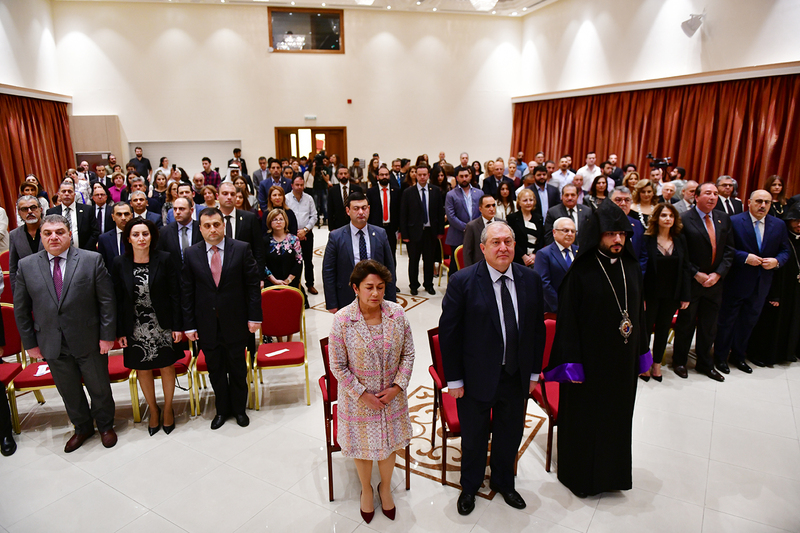 Those, who participated to the great changes that took place in Armenia. i.e. the Velvet Revolution or Armenian style revolution, where not only citizens of Armenia or individuals on the streets of Yerevan. The number of participants was huge. 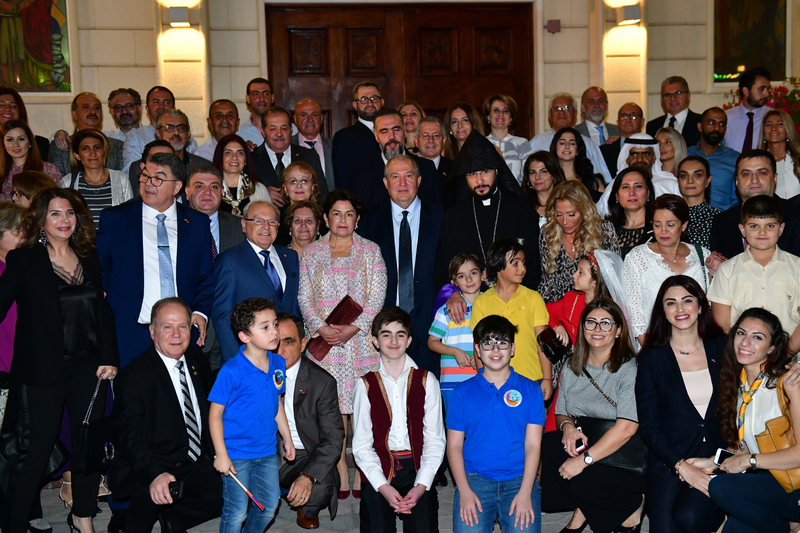 In a certain sense, it was our whole nation – from Los Angeles to Europe and Middle East, all were living through the situation in Armenia, following the events in Armenia and in the Fatherland in general. I believe that our nation is a nation of the 21st century, because in the 21st century many values will change; in the 21st century powerfull will be not the nation or the state, which has ample natural resources, but the nation which will be able to unite small forces on a small territory, which will be able to collect its intellectual abilities and make them serve the Fatherland. I trusrt we have all that, even more; I believe that we are a God chosen nation. We are a nation which through God’s will had gone through the most impossible hardships, had seen hell on earth – the Eghern. But today we not only live, not only exisit but are strong and powerful. We are a nation which always wins. Future victories lie ahead, and they will happen not only on the battlefield but in all areas of our national interests and statehood. 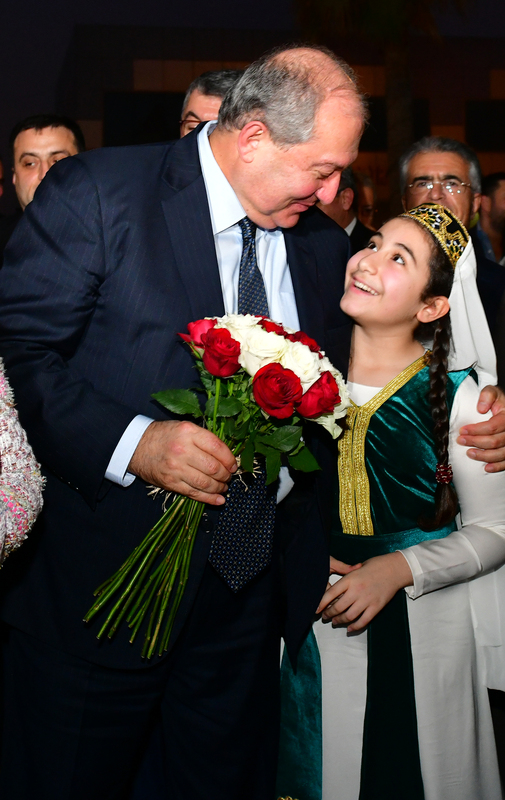 The President of Armenia viewed as necessary that all together and united we serve our common goal, our Fatherland, our people, our nation spread all over the world. “You, your parents, parents of your parents were born in Armenia. Thus, you all are Hayastantsi who temporarily live abroad. But one day, God willing, all will return to a great, free, independent, and democratic Fatherland. 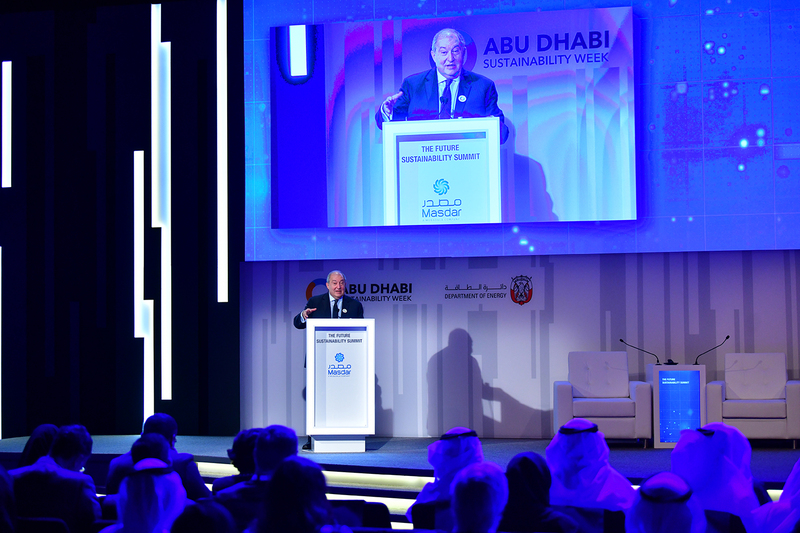 I am confident that you will not only return but we will become one of the leading nations of the world because in the 21st century intellectual abilities will become the greatest asset, and we have them in abudance. 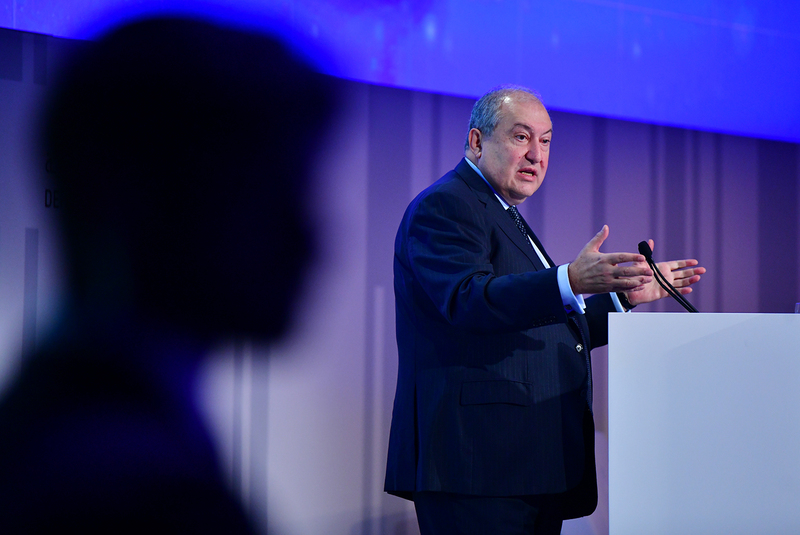 Thus, I believe that the 21st century truly belongs to us, however steps towards it should be taken today,” President Sarkissian said. 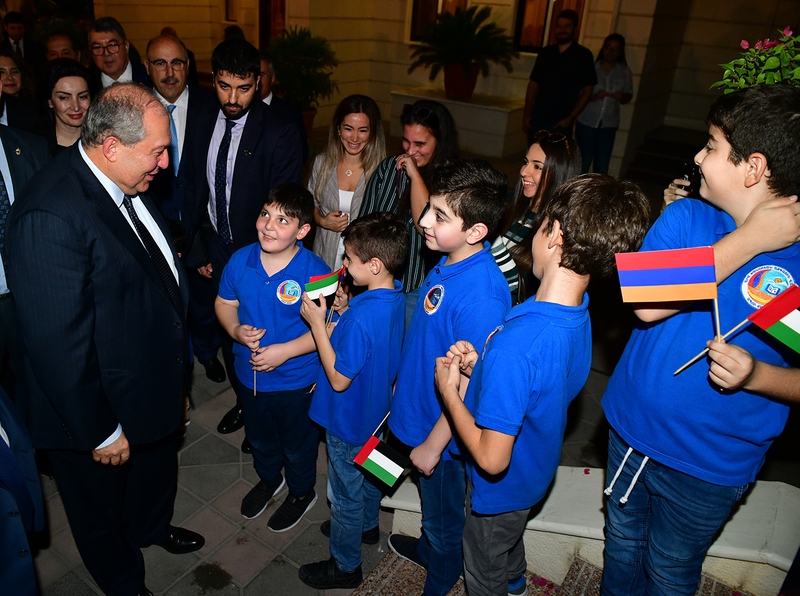 President Armen Sarkissian, who is in the United Arab Emirates on official visit, and Mrs. Nouneh Sarkissian visited today the Embassy of Armenia at the UAE. 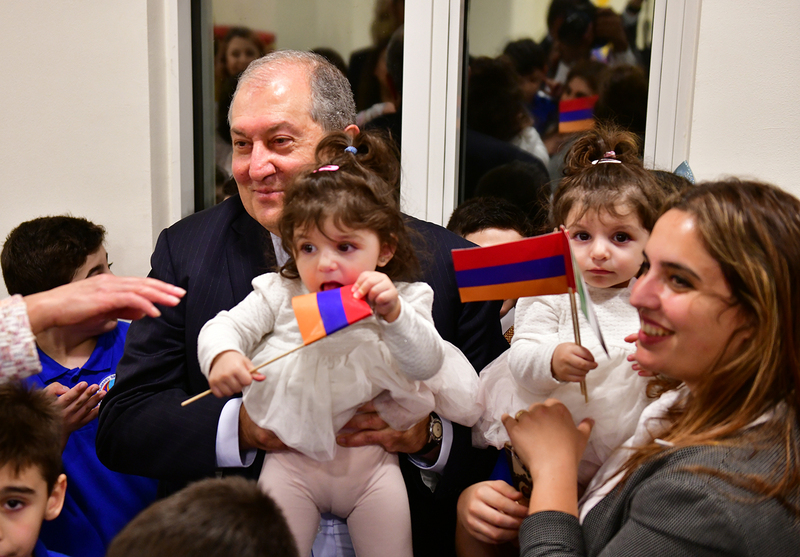 The President of Armenia planted a tree at the backyard of the Embassy.